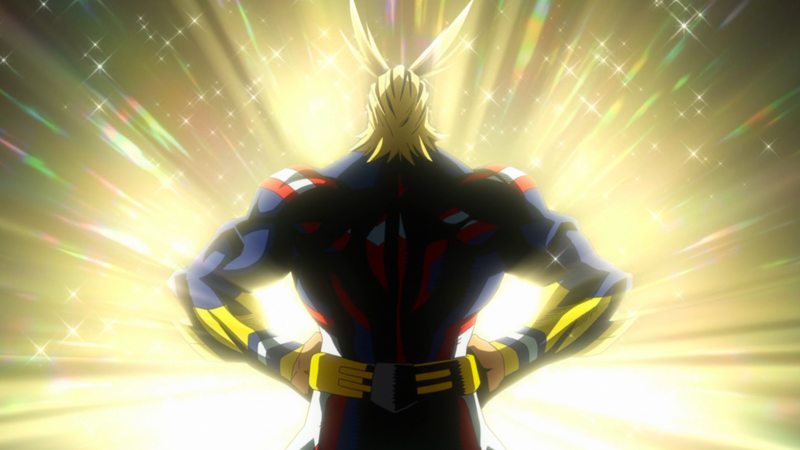 It’s hard to miss how My Hero Academia draws inspiration from American superhero comics, whether it’s the use of half-tone screens and visible sound effects, the dazzling array of colorful spandex uniforms and creative super hero aliases, or the sheer existence of All Might himself, a paragon—perhaps even parody—of superheroism, down to being the only character in the show shaded with solid blacks. But don’t be fooled for a moment, as it’s still a very Japanese show. 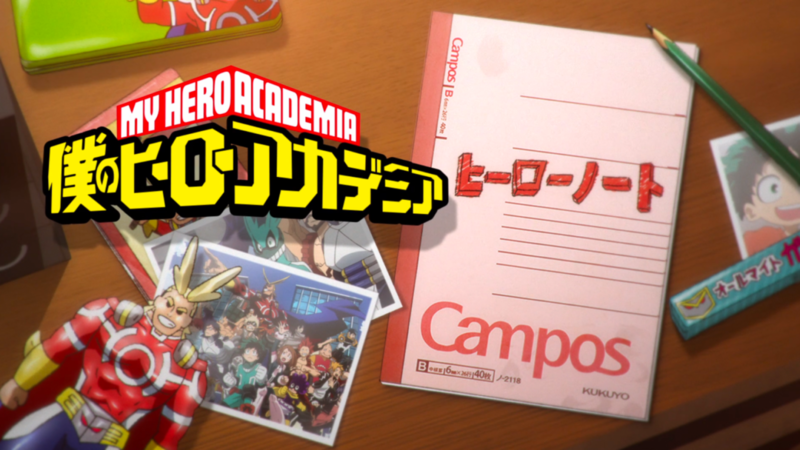 The main cast attend a superhero school (because of course they do), and our protagonist, Midoriya “Deku” Izuku is set to follow the ever-popular zero-to-hero shounen journey. 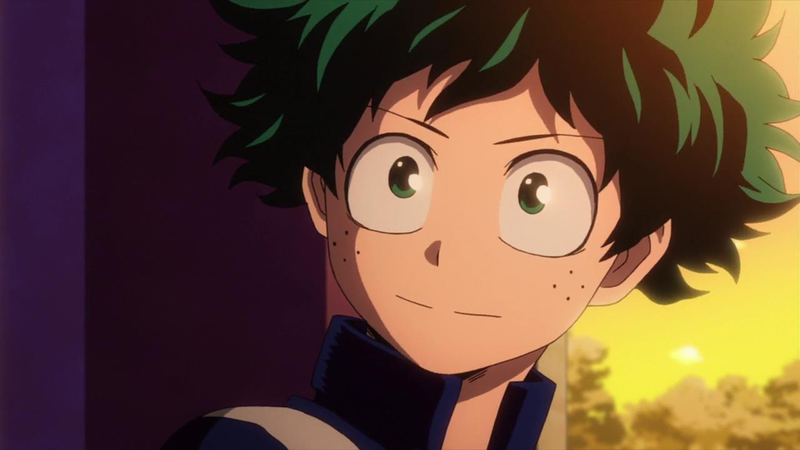 In a world where 80% of the population is born with a “quirk,” the show’s name for super powers, Deku is forced to face that he, no matter how much he strives to be a super hero like his idol All Might, cannot overcome the immutable fact that he has no quirk to call his own. Despite this, Deku is so emotionally invested in the concept of the superhero that he constantly assesses every battle he witnesses, detailing countless minutia and cataloging it in his hero notebook. It is with this knowledge that he manages to face a supervillain and attempt to save his childhood friend Bakugo from certain death. 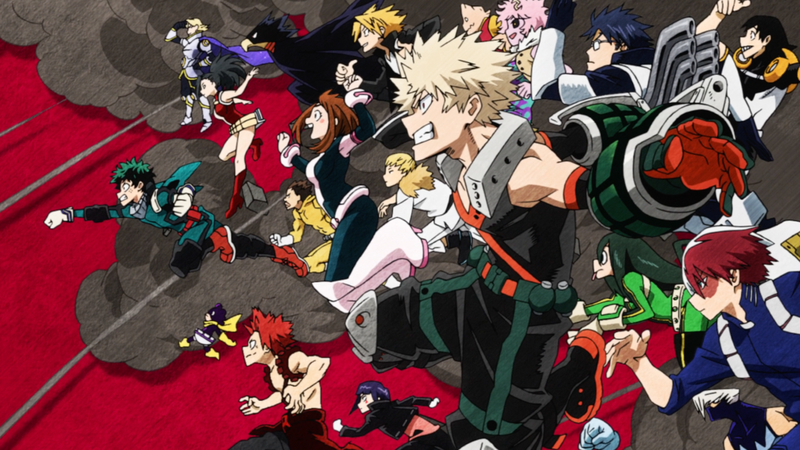 Through this selfless bravery, All Might realizes that Midoriya has what it takes to be a superhero and reveals a tremendous secret, that he can pass on his powers—and that he has chosen the green-haired youth to receive them. Honestly, I was half-disappointed by this. 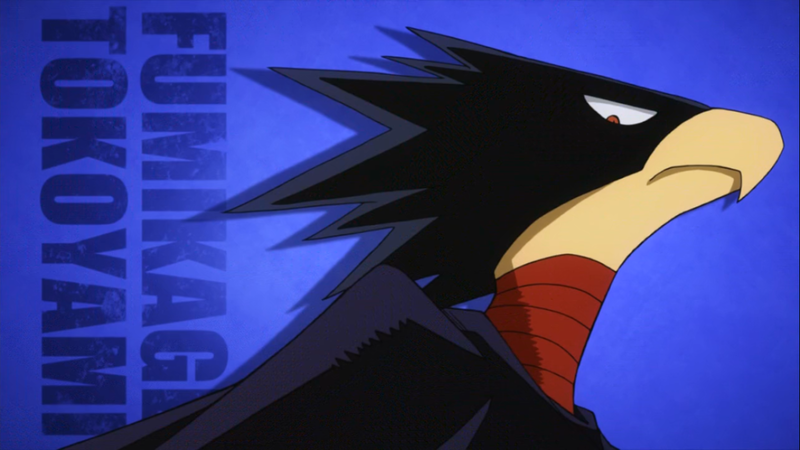 I saw in Midoriya’s first “battle” the potential for something unique, a shounen show that bucked the “blessed golden child with the ultimate power” in favor of Deku, a selfless, caring boy who would somehow make it through by his wits alone, using his encyclopedic knowledge to overcome his lack of a quirk and become a hero despite it all. 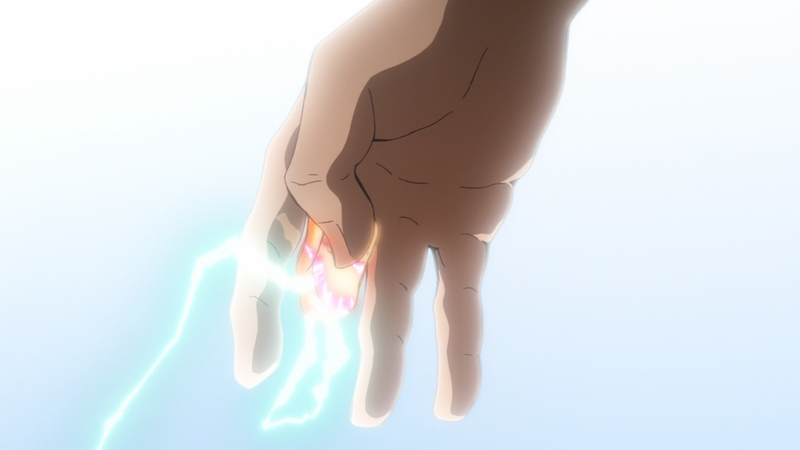 When All Might passed on a small piece of his power, I crossed my fingers for it to be a sort of Dumbo’s feather. This was not to be, of course, as Midoriya does in fact inherit All Might’s quirk “One For All,” but the show cleverly manages to accomplish everything I hoped anyway. With the immense power provided by One For All, Deku is grievously injured any time he attempts to use it. While this does provide his character a built-in McGuffin any time the plot calls for it, for the most part Deku has to creatively work around using his quirk as minimally as possible. 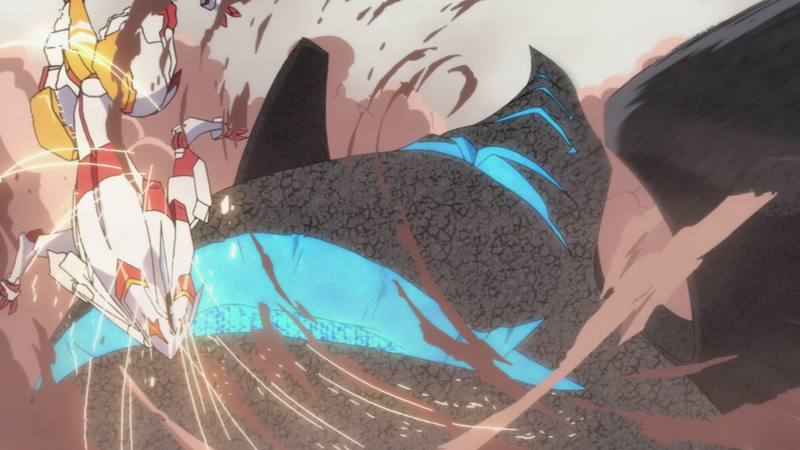 It spins the usual shounen trope of overcoming obstacles with reckless shows of power and makes every encounter an exercise in careful calculation. Moreover, Deku’s constant sacrifice is just a magnificent tear-jerker every time the show’s excellent musical score swells. That’s pretty fitting, since I think there’s good argument that Deku did have a quirk: the ability to pour forth obscene amounts of bodily fluids out of his face. But Deku is just one part of My Hero Academia. I think what is actually one of the most fascinating things about the show is how the main characters work together. 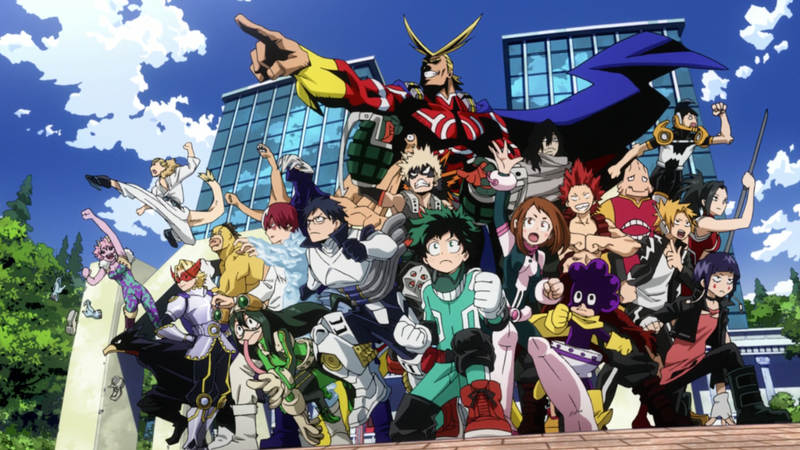 Hero teamups—heck, superhero teamups, are hardly a new concept, but whereas it’s typically just a merry-go-round of characters showing off their expertise, My Hero Academia really highlights the students using their quirks in creative ways to overcome each other’s weaknesses and maximize their potential. 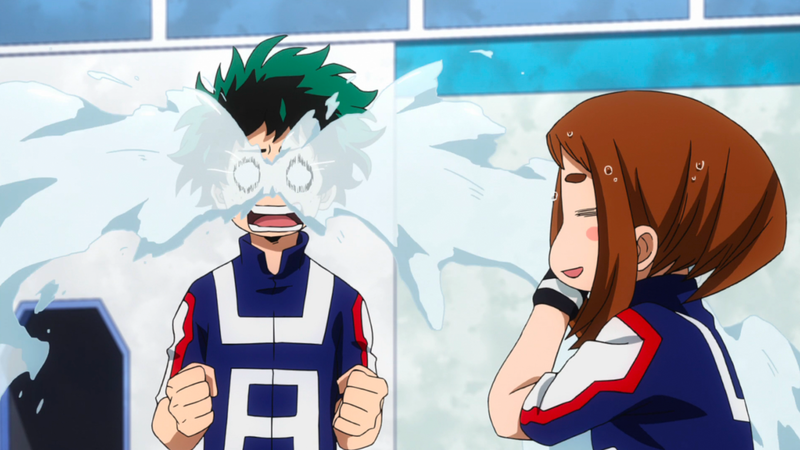 Whether it’s Yaoyorizu using her “Creation” quirk to create a electric proof barrier so Kaminari can shock the field, or Todoroki cooling off Iida’s overheated engine exhausts so he can wrench out just a little more power, watching these young heroes triumph in the face of adversity is a joy to watch. If there were a criticism I’d level at My Hero Academia, it’s that there’s some serious body horror going on. 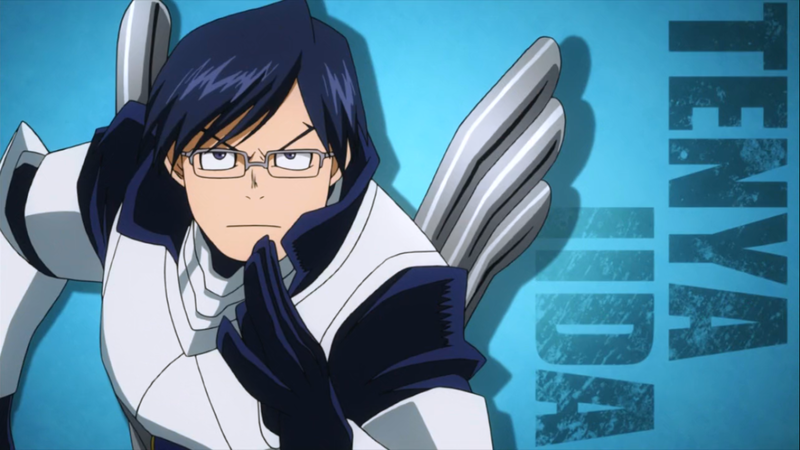 Whether it’s Iida’s aforementioned exhaust pipes jutting unnaturally out of his calves, Hanta ejecting tape from his elbows, or just Midoriya’s penchant for flying through the air with multiple limbs broken and flailing, I can’t help but continuously be a little squicked out as I watch. Yet, it’s hard to complain too much about that, as there’s so many genuinely fascinating quirks being shown off here. 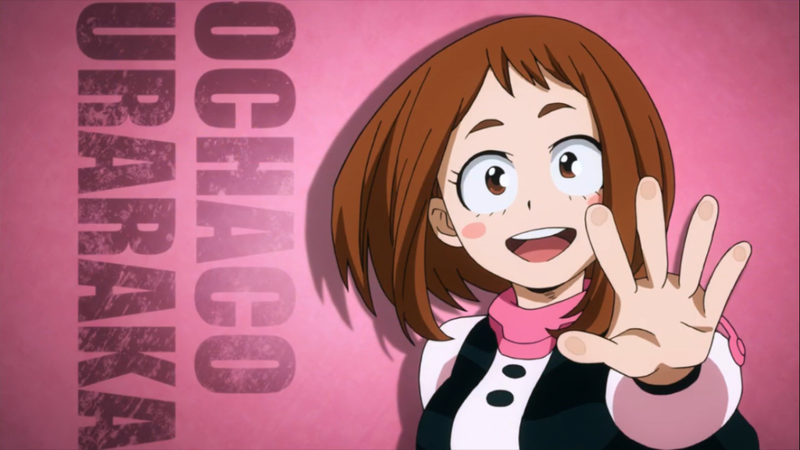 There’s standbys like super strength and super speed of course, but then there’s Ochaco’s ability to eliminate gravity for everything she touches, Yaoyorizu’s creation, and yes, even Mineta’s super-sticky hair balls that remind you that My Hero Academia is more than just a nod to the Western super hero, but instead a uniquely awesome thing of its own. Moreover, despite the fact there are a lot of really weird looking quirks, this is never brought up by any character. There’s no teasing, no horror, no disgust. Everyone’s differences are accepted—embraced really. In the end, the show is a tribute to what we can do together, and that’s a goal that surpasses prejudice and shame. We can all be heroes—we can go beyond. 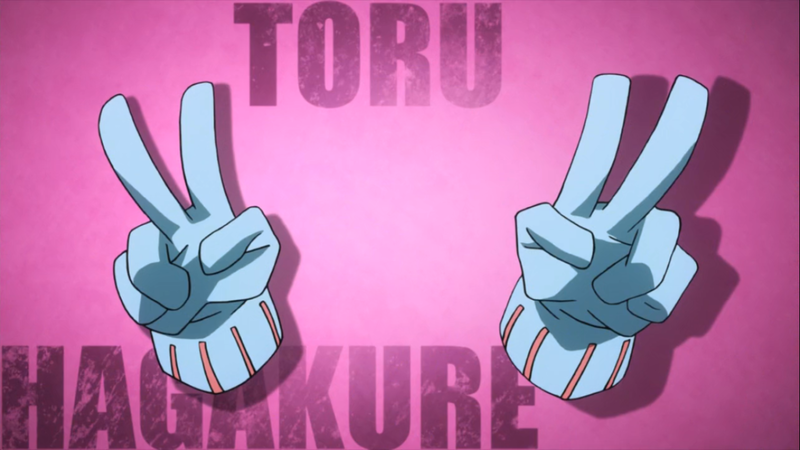 Even if we don’t have a quirk. 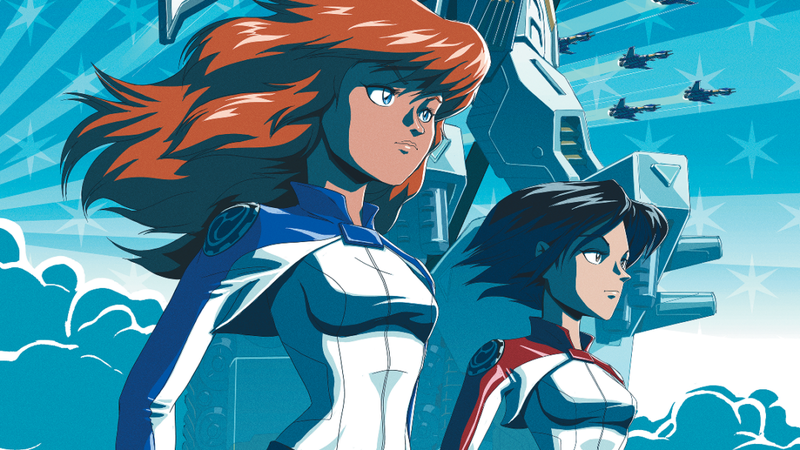 Many moons ago, I remember reading on a forum where someone criticized the original edition of OVA as “just a supers game with an anime coat of paint.” I never really saw this as much of a criticism. What is a supers game, after all, if not a system attempting to embrace all possibilities? But hey, I guess that means it’s well-suited for My Hero Academia, right? Let’s take a crack at representing a few of the show’s many unique quirks. One For All (Midoriya)—Few things compare to the sheer power behind One For All. Wielded by All Might, it’s a strength so powerful that seemingly no enemy can withstand it, and even simple feats like jumping appear more like flying. However, in the hands of an inexperienced youth like Midoriya, it is an unwieldy, dangerous power—one that’s as likely to hurt the user as it is to accomplish its goals. 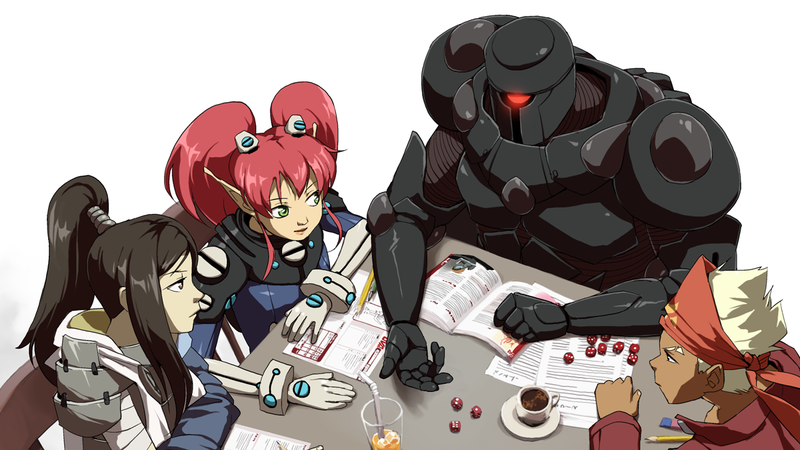 When a character activates One For All, they must make a roll using their One For All dice and compare it a DN based on the Bonus they wish to receive. This Bonus still goes into effect even if the roll is failed. However, the character will receive an Impairment. If the character attempted a DN of 6 or 8, it will be a –1 Impairment. 10 or 12, –2, and 15, –3. The Bonus only applies to one action. If the character wishes to apply the Bonus to another, they must again roll on the previous table—and again risk injury. 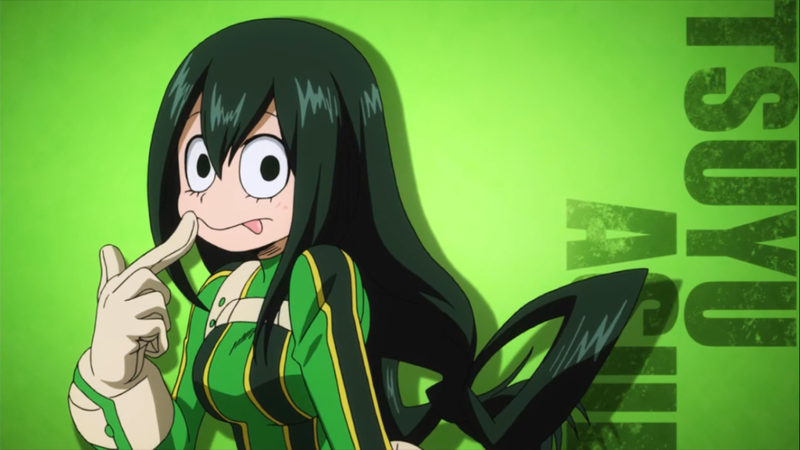 Characters with more training can take advantage of a more sustainable version of the One For All Quirk. It’s less effective for the same difficulty. However, the bonus may be maintained throughout a single combat. This is called Full Cowling. Unlike with the more powerful version of One For All, Full-Cowling failure doesn’t injure the character. However, they are Stunned and lose their action. If they want to receive their desired bonus, they must try again next round. One For All’s Bonus is generally for strength related tasks, though it can also be harnessed for speed and maneuverability when appropriate. The Game Master has the final say on what can and can’t be accomplished with One For All. 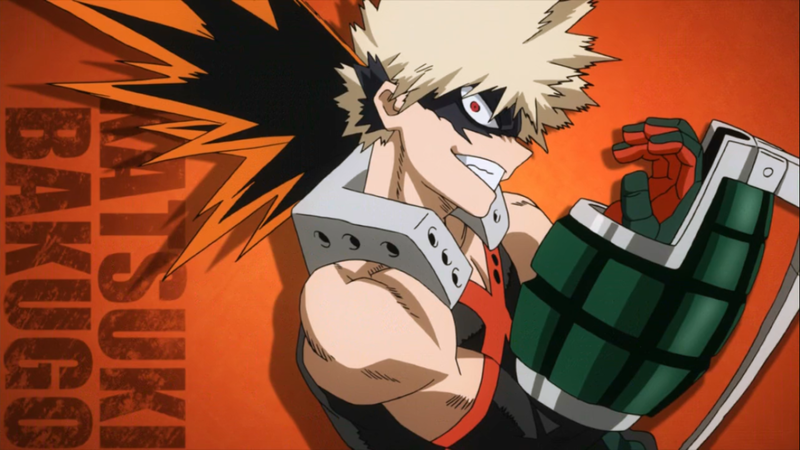 Explosion (Bakugo)—The Explosion quirk is a fairly straightforward damage-dealing ability best represented with a suite of attacks, . However, creative use of these explosions can allow for increased Quickness and even something akin to Flight, so including these Abilities would be appropriate. Zero Gravity (Uraraka)—Zero Gravity is effectively the Telekinesis Ability with the following limitations: A character must touch the object before it can be manipulated, and any objects of 12 or higher difficulty will cause the user to become nauseated soon afterwards. A character suffering from Zero Gravity induced nausea may take no Actions next turn, not even Defense Rolls, while they recover. The user may also cancel the effect of Zero Gravity at any time by placing their fingertips together. The resulting falling objects may be quite dangerous themselves. Use the DX chart on page 110 of OVA, and the Distance Fallen chart on page 111 to represent this. If the exhaust pipes for the Engine are in any way obstructed, the Quirk cannot work. 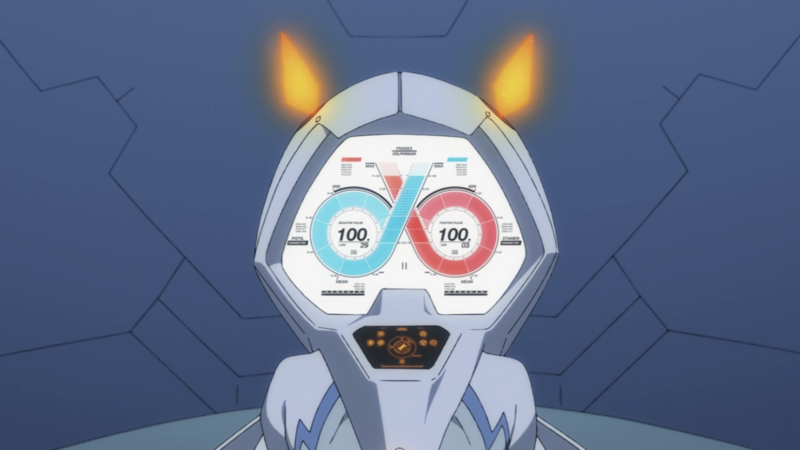 By the same token, if another character can forcibly cool down the overworked Engine from Recipro Burst, the effect may be extended another two rounds. 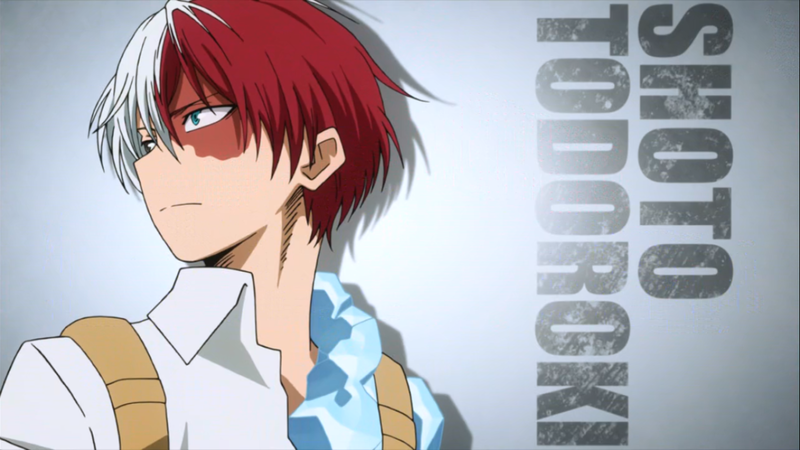 Hot & Cold (Todoroki)—Whereas most heroes’ quirks tend to be rather focused, Todoroki’s hot and cold halves give him a pretty versatile moveset. At the forefront is the sheer power of his attacks, so giving him high Levels in Attack is a must. (Don’t forget to include Affinities for Hot AND cold!) His ice side can also be creatively used as a Barrier. Frog Form (Asui)—While it might be tempting to assign a bunch of custom Abilities to represent various frog powers of leaping and tongue swinging, you can really cover both with elevated levels of Agile and Quick. Including an attack with the Paralyzing Perk and Ineffective or No Damage Flaws for more offensive uses of her tongue is also a good idea. And Ranged. Lots and lots of Ranged. Camouflage is easily covered by Art of Invisibility or even full-on Invisibility. 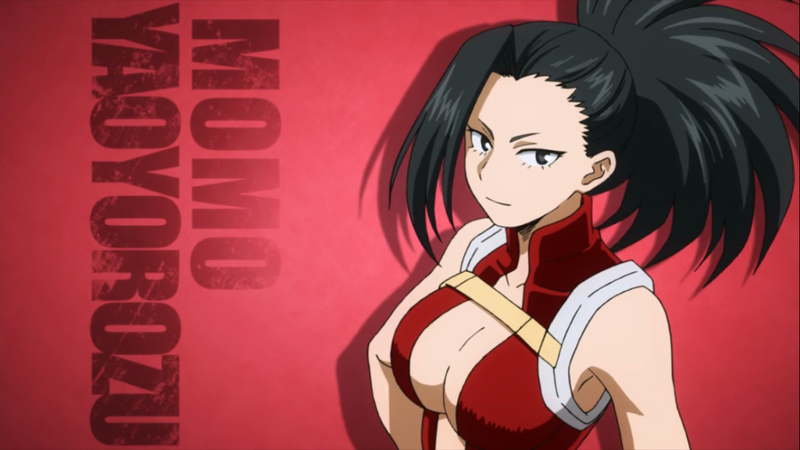 Creation (Yaoyorozu)—The Creation Quirk works similarly to Dimensional Pocket (p. 52 of OVA). However, difficulty—instead of being based on usefulness—is based on the size of the item being created, and instead of rolling against a Difficulty Number, more difficult items simply take longer to create. For each Level you have in Creation, reduce the number of Rounds required by 1. If this number is reduced to zero, the item may be created instantaneously. It still requires an Action, but the item is immediately in your possession. There are a few other limitations to Creation: Only inanimate objects may be created, and objects created require exposed skin to manifest. Larger items require greater surface area in order to successfully complete, making minimal attire preferable when using this quirk. 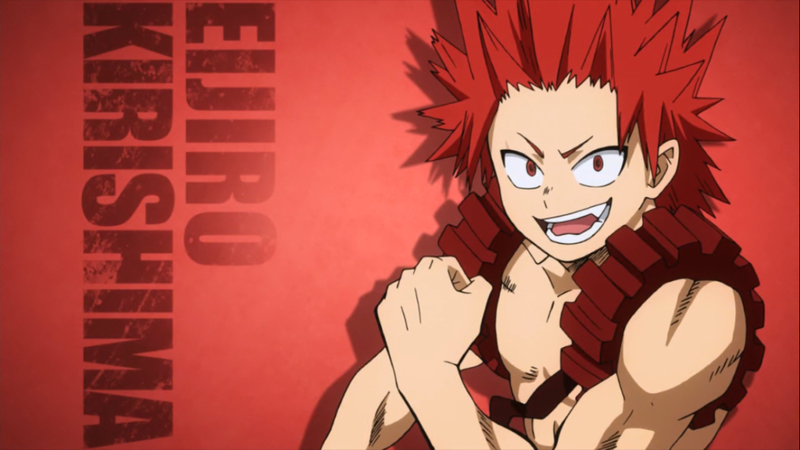 Hardening (Kirishima)—One’s first impulse may be to represent this quirk with Armored, and that would work fine. But I think using Barrier is a better fit for two reasons: 1) Hardening is almost always shown as completely negating Damage, which only Barrier can do reliably, and 2) Hardening grows less effective over time. This can easily be representing by having less and less Endurance to spend on nullifying damage. Hardening also seems to impart some bonus to power, so including a few Levels of Strong is also probably a good idea. 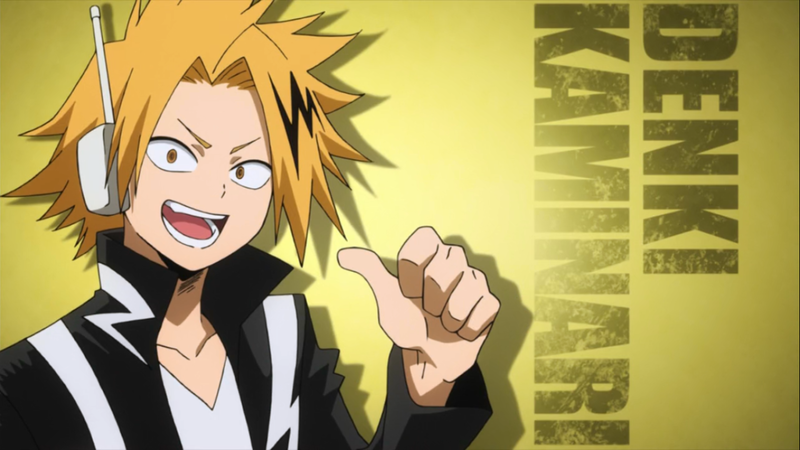 Electrification (Kaminari)—Some heavy doses of Area Effect and Effective combined with Cancel (Non-Conductive Objects) and a special Flaw of short-circuiting the brain will result in suitably shocking Ability. What can be specifically represented is Dark Shadow’s most overt shortcoming—the fact that it is much less powerful in bright light than it is in darkness. The WeaknessSuppressed Power will do the trick nicely. One can also throw in Accidental Transformation to represent the loss of control should Dark Shadow’s own force of will overwhelm the user’s. 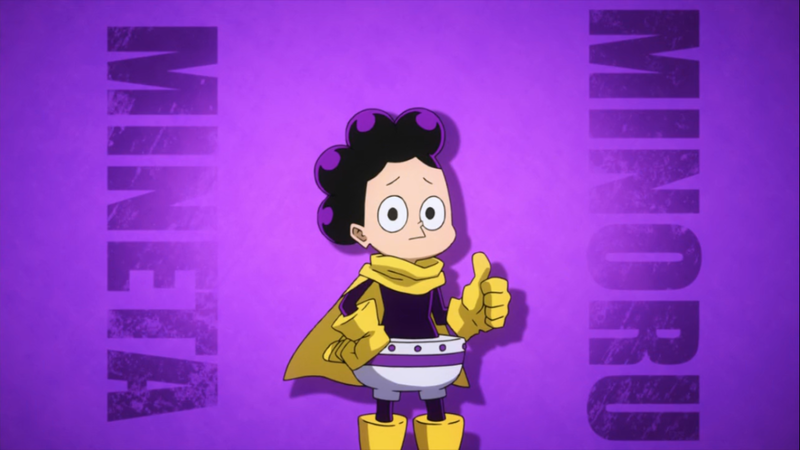 Pop Off (Mineta)—Oh Mineta—to be honest, you could probably just handwave all of Mineta’s “powers” since he’s played up almost entirely for comic relief. But if you want, you could make a suite of Attacks using Perks like Impairing and Paralyzingbut the No Damage Flaw. Trap is another great consideration. 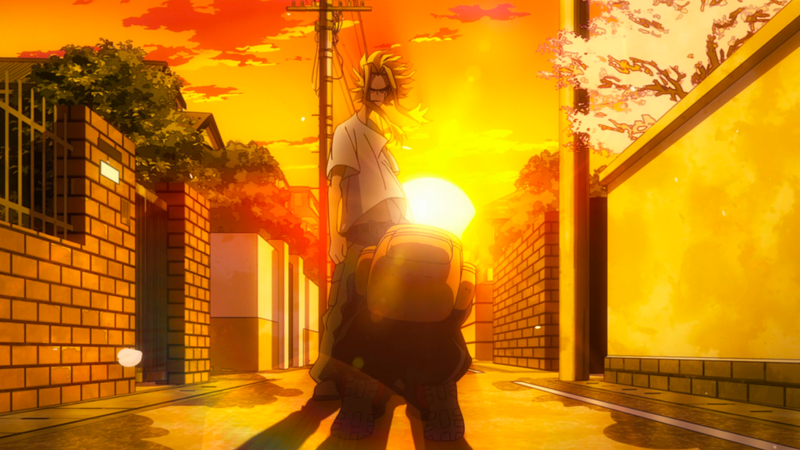 And that’s it for My Hero Academia! 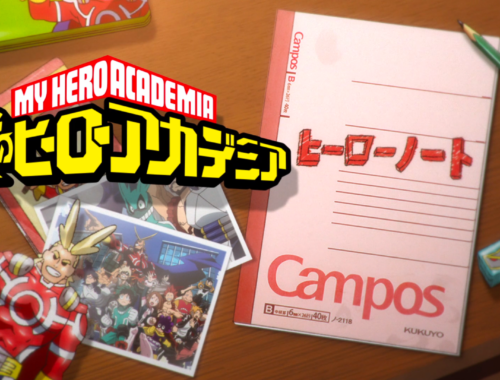 Of course, there are many, many other students with equally OVA-able quirks—and I haven’t even touched on the faculty or the villains—but it should give you a good start on putting a little PLUS ULTRA in your game. But for the sake of discussion, what is your favorite quirk missing from this list? Tell me in the comments below! 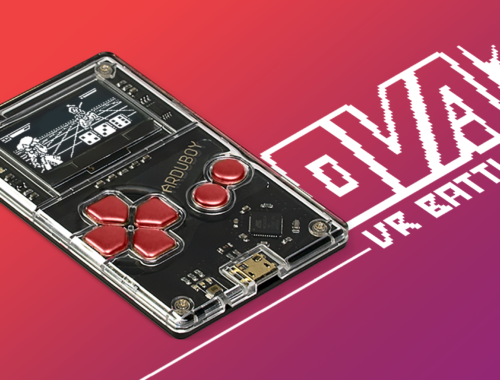 I’ve had some time to reflect on the future of OVA, and I decided it is high time to move away from the pencils and papers of yesteryear and fully embrace the future: video games! But too much “future” at one time is a risky proposition for a well-meaning time traveler, so I’m hedging my bets and adopting the Arduboy Arduino-powered 8-bit console. This little piece of hardware is the perfect compromise between the future of gaming and a little bit of its past, too. And since it’s hardly bigger than a credit card, it can go everywhere you go! Wise Turtle’s first release will be OVA: VR Battles. Everyone’s favorite Missile Maiden Miho has been sucked into a virtual reality world and forced to battle cyber versions of friends and foes alike! 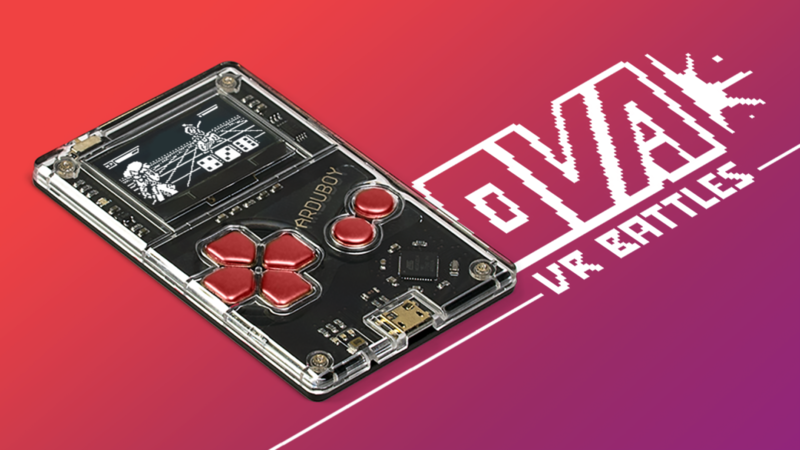 Play on a special OVA-branded Arduboy, shipping April 1st, 2019! So are you excited? I know I am! Let me know what you think in the comments! 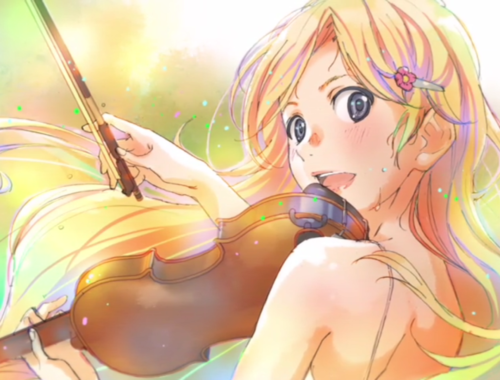 Fittingly, Your Lie in April is possibly the prettiest anime I’ve ever watched. 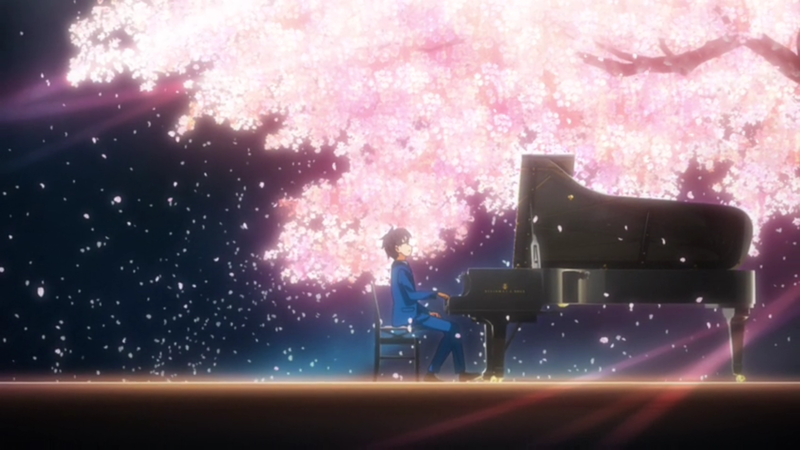 Almost every frame is, well, frame-able, with enough cherry blossoms dancing by to fill one of the show’s many musical venues to capacity. It’s somewhat telling that the narrative skips through summer in quick tempo in order to portray similar feats of ambiance and beauty with the falling leaves of autumn. 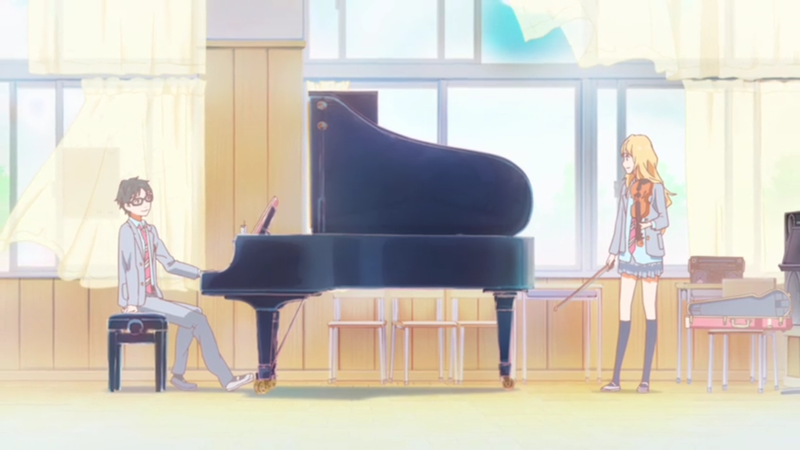 It would be easy to say that Your Lie is too pretty for its own good, shoveling in the sakura until nothing really stands out. But that’s where the show’s most surprising, and most brilliant, juxtaposition comes in. Despite weaving a tale traversing the depths of human feeling, the show breaks up the heaviness with full-on bouts of comedy. Characters super-deform, light on fire, human torpedo each other, and otherwise elicit the kind of silliness that, at first, seems out of place. But it’s this constant reminder of levity that keeps the show from becoming a mirthless slog. 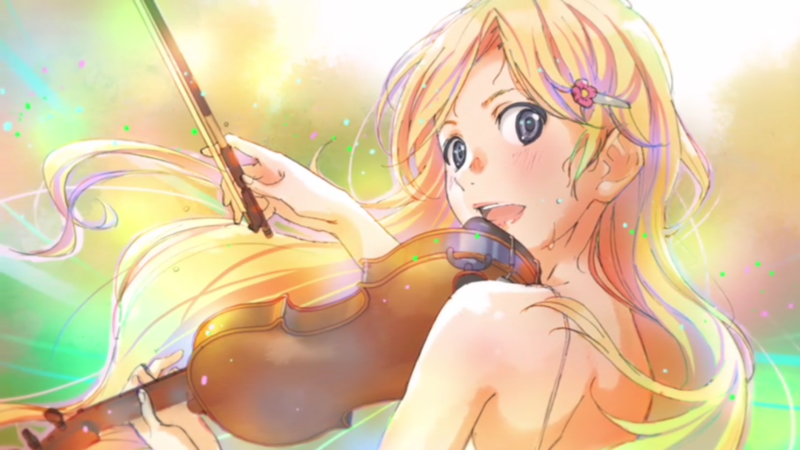 Calling Your Lie in April a realistic exploration of the human condition is a stretch. As they struggle with love and loss, most of its fourteen-year-old cast spout poetic treatises and wax nostalgia like middle-aged wordsmiths, but that’s okay. Lie is like the music it so throughly admires throughout the show. It is an idealized form of expression, carefully crafted to elicit the strongest emotional response. 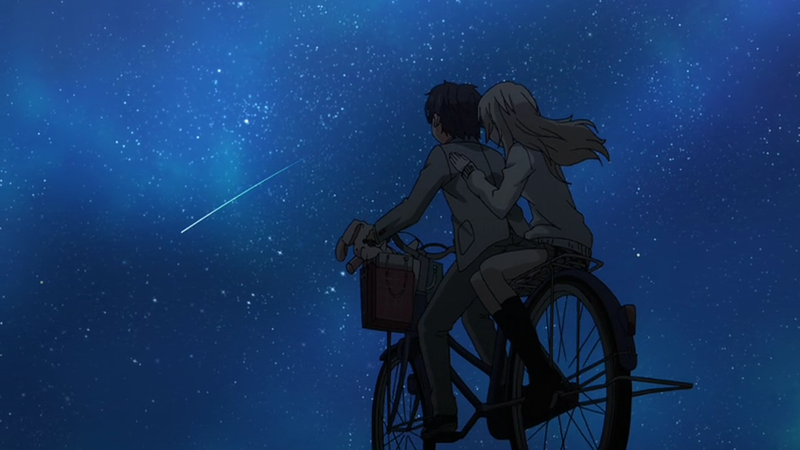 Whereas Erased celebrated the every day with its loving vignettes, Your Lie in April exalts it, creating a tapestry of the slice-of-life at its absolute most heart-wrenchingly beautiful. 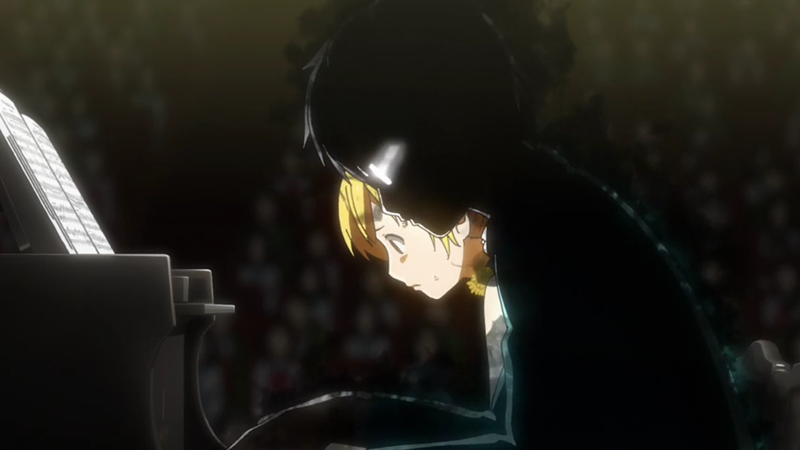 It’s utterly preposterous, of course, but somehow—like the rest of Your Lie in April—it is in its way the most honest. This melodramatic, over-the-top rendition of the humble musical performance conveys, just a small fragment, of the actual feelings that music can imbue. 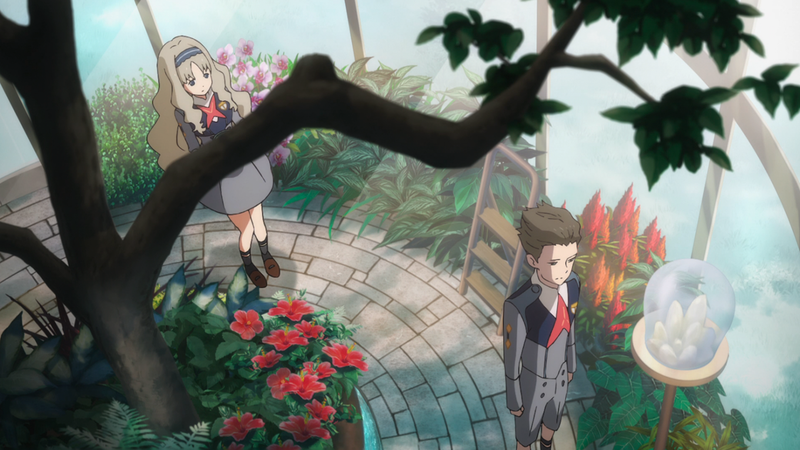 The show’s own score, while more limited in variety than the many classical composers it features, manages to stir up the heartstrings regardless of how many times you hear the main dramatic theme. 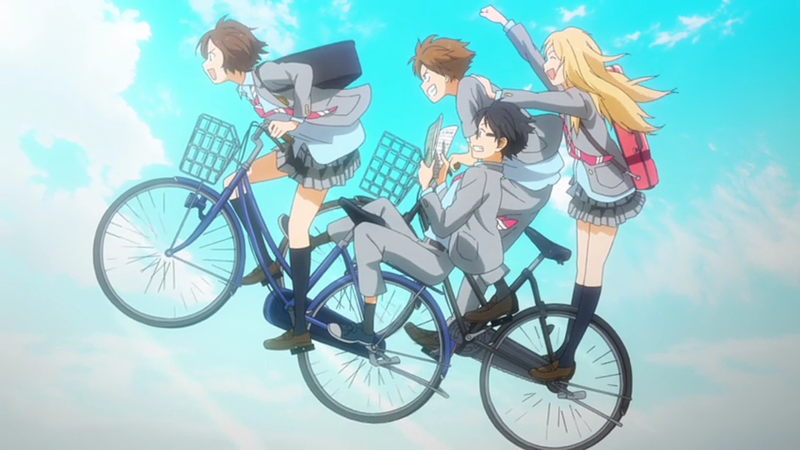 And despite the show’s many dips into melancholy, I appreciate that Your Lie is always up front and honest about it. The show’s main “twist”—if you can really call it that—is telegraphed so early and often that its reveal doesn’t feel like an ambush. The show’s drive for emotion never feels contrived or unfair. 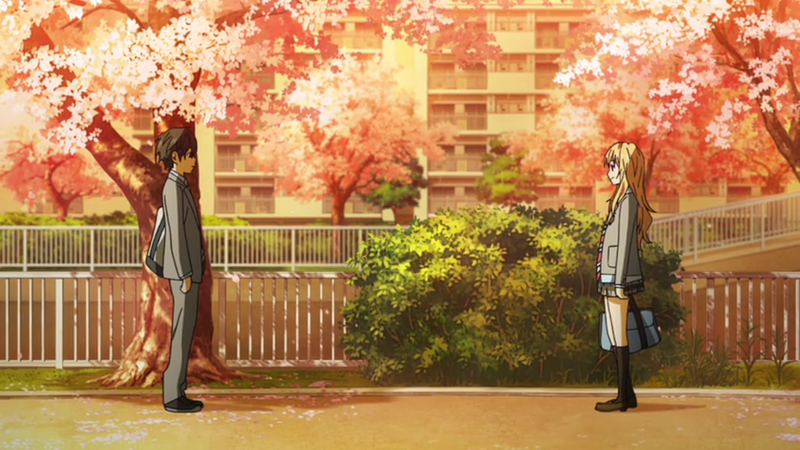 In fact, I think the real lie in Your Lie in April is the one you tell yourself. Until the show’s tear-jerking finale, I found myself hoping against hope that, perhaps, another resolution was possible. In the end, every piece of music has its end, its finale, its coda. 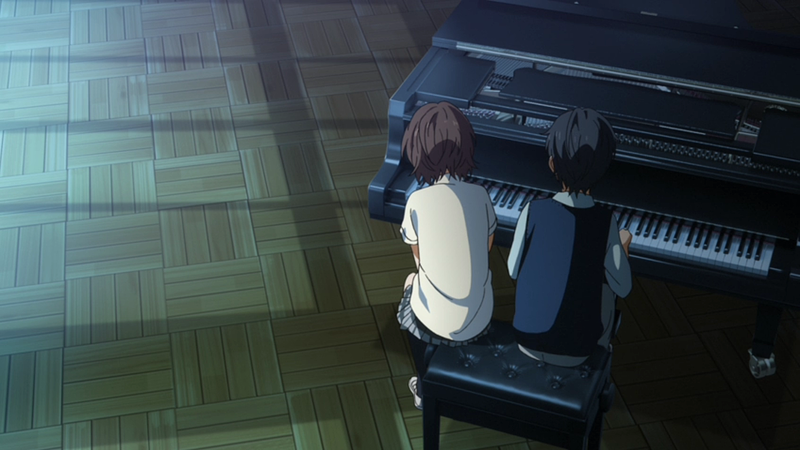 And Your Lie in April finishes exactly where it had to all along. Given how much vim and vigor is generously applied to Your Lie in April’s many performances, it’s actually really appropriate to represent the rise and fall of a given performer’s playing, confidence, and will with a few custom rules. When a performer—whether that’s a pianist, a singer, or even a stand-up comedian—gets on the stage, they are immediate faced by their audience. Sometimes, the entire audience matters. Other times, it is only a choice few, be it trying to capture the heart of a loved one or impressing the hard-nosed judge. Whatever the case, the audience is given a DN based on how hard they are to impress. A fun night out at karaoke is prone to require a paltry 4 or 6, while world competitions may require 12—and beyond! But performances are rarely the matter of a single roll. A good performance requires consistency and stamina. The Game Master will determine the number of successful rolls required to make a performance successful, and also the maximum number of rolls that can be made. The number of rolls is not necessarily the length of the performance itself, but a measure of the dramatic weight the performance carries. A night like many other nights in a concert tour may be handled by relatively few rolls, while one song in the ultimate final performance of a tournament may require many. Likewise, too many missteps, false starts, and errors will bring the performance to a crashing halt, even if there were great successes along the way. In between each roll, Players should take the time to role play their experience, whether they are the performer or the audience. A performer’s skill will take them a long way—but sometimes it is not enough. No amount of practice or aptitude can stave away the threat of one bad roll too many. By spending Endurance, Players can earn Drama Dice to improve their results. Sweat drips off their brow, the score bends to their will, and for that moment the very soul of their playing is channeled through their instrument and into the audience. In fact, performers can do this even if they succeeded already. After all, wouldn’t an Amazing Success be that much more…amazing? But this emotion is not always appropriate. There are competitions where playing to the composer’s intent, by every note and measure, is required. In these cases, spending Drama Dice may disqualify the performer on technical merit alone. But audience choice—well, that’s another matter entirely, isn’t it? Alas, performers don’t exist in a vacuum. As intently as they might focus on their performance, the outside world can threaten to break in and disrupt all they have struggled to achieve. Doubts, fears, past traumas and current stress all can meddle with the ability to perform. When such Demons rear their ugly heads, they make a roll. Minor worries might be represented as two dice, while persistent dreads can roll five dice or more. If the Demon roll ever beats the character’s own performance roll, it cancels it out, even if it would have been a success! Of course, characters may still dig deep to overcome them. 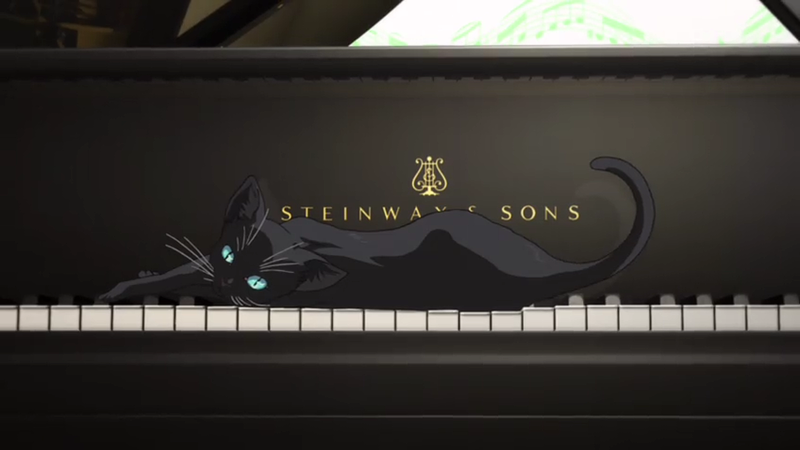 Speaking of music, readers, do you have a favorite anime with that subject as its focus? How about your favorite anime soundtrack? Tell me about it in the comments! Also, if you’d like to support this blog, consider purchasing Your Lie in April merchandise like comics, Blu-ray boxsets, and figures from this link! 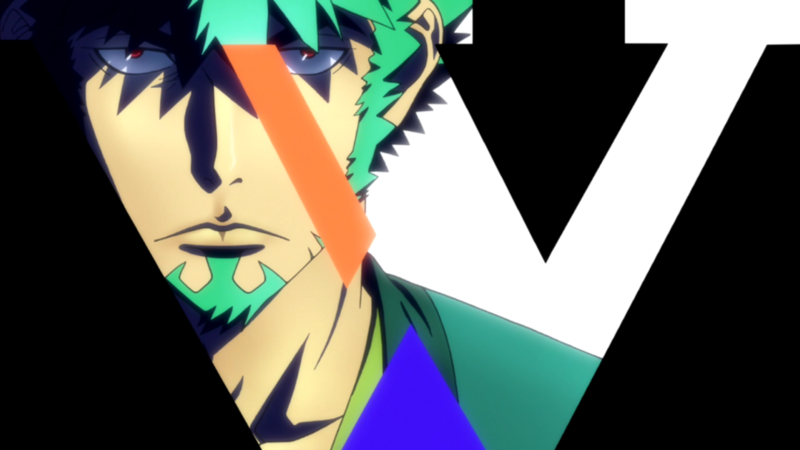 Dimension W revolves around the titular fourth dimension beyond X, Y, and Z, a mysterious realm from which society has learned to extract limitless clean energy through the use of coils. However, there are those that make use of untraceable counterfeit coils to carry out their nefarious goals, and it’s up to collectors to find and subdue these criminals—and, naturally, collect their coils. Kyouma Mabuchi is such a collector, but one at odds with the modernized world around him. He eschews the convenience of coils almost entirely, making use of humble skewer-like weapons and driving a gasoline powered car he restored himself. Even his clothing is a throwback, being much more in line with traditional Japanese attire than anything kin to the contemporary. 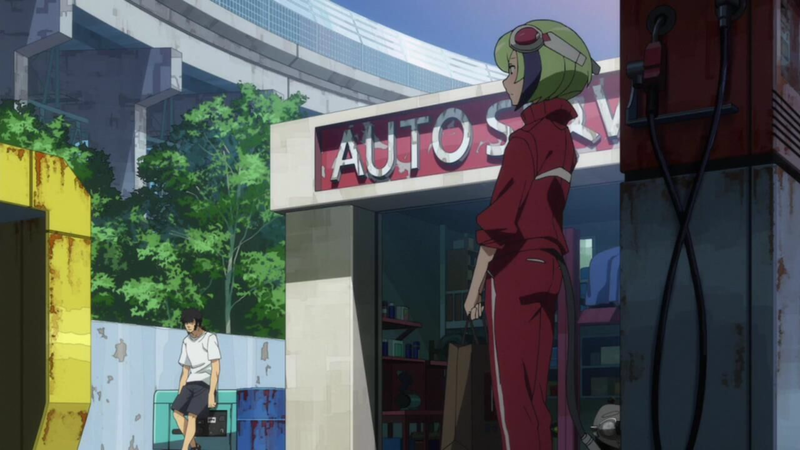 It’s a quirk that immediately endeared me to Dimension W as it’s the sort of eccentricity that resonates with me. Despite using computers nearly all my life, I’ve always felt kinship to the physical, to old dusty tomes and tabletop games that were created before I was born. Even with the digital world, I find myself gravitating to the “retro” classics of yesteryear with their pixels, beeps, and boops. There’s just something inherently romantic about obselescence, and it’s a theme that Dimension W visits numerous times in its narrative. But Kyouma is only one half of the equation, and in short order he’s paired with Mira, a mysteriously advanced, and of course coil-powered, android that represents everything Kyouma has done his best to leave behind. 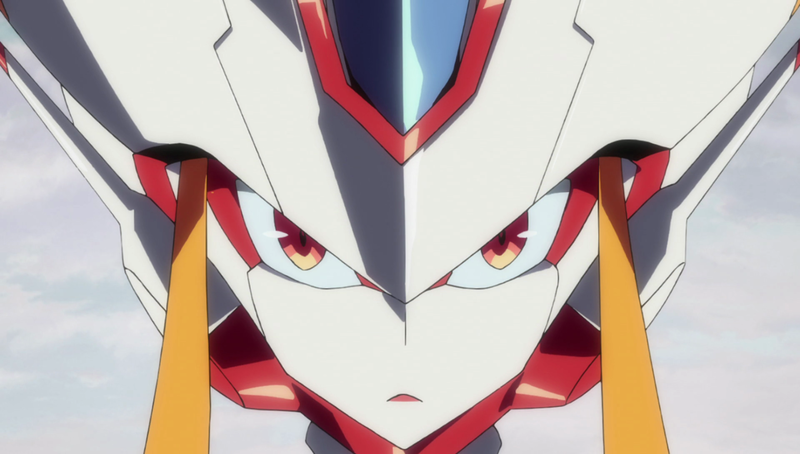 It’s no secret that I love the gynoid archetype—Miho, after all, was the first character I created for OVA—and Mira is a particularly likable example. 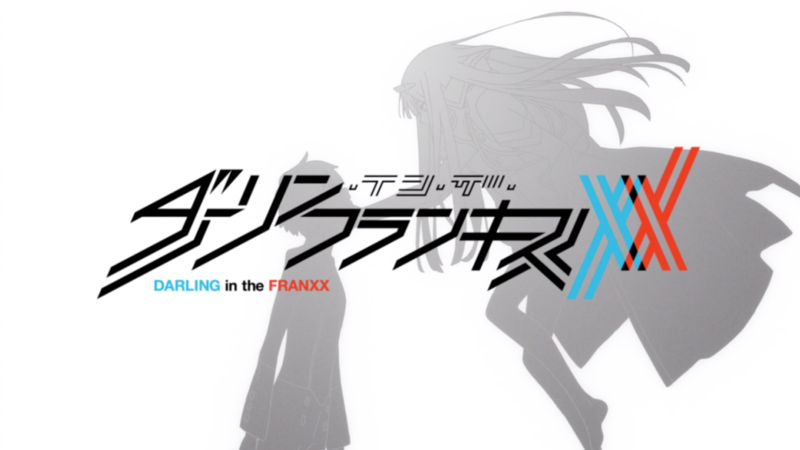 The strained relationship between the duo gives some meat to the usual robot-girl-wants-to-be-accepted-as-human plotline, and the combination of these opposites just made me fall in love with the show. In fact, I really wish there was more of it. In the first few episodes you see glimpses of a sort of slice-of-life story that could have been. 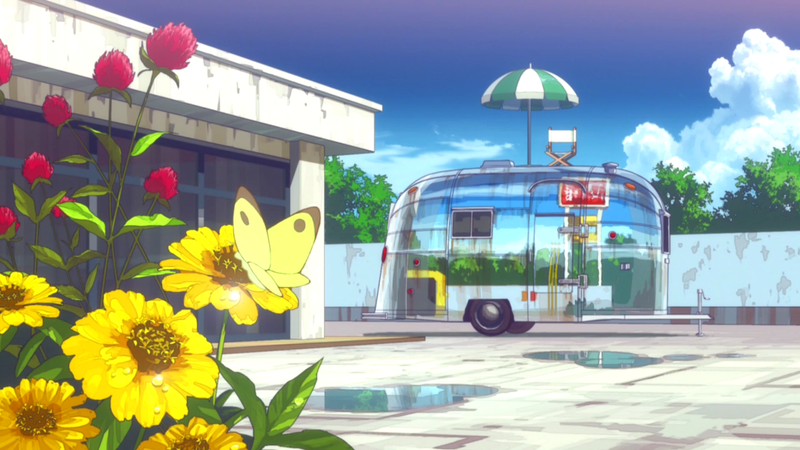 Whether it’s Mira fixing up her Airstream trailer with second-hand furniture or Kyouma tinkering with his cars, there was real room to show off the development of their relationship. 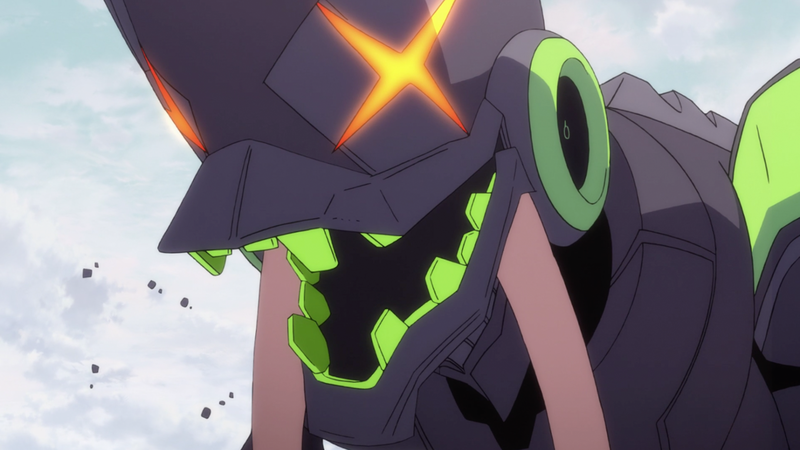 Alas, by episode 4, the show’s plot is picking up speed, and by midway through the series devotes almost every minute juggling its mysteries and secrets, carefully pacing its reveals so you never quite have the entire picture, whether its the specters of Kyouma’s past, the ominous existence of the original Numbers coils, or the true nature of Dimension W itself. 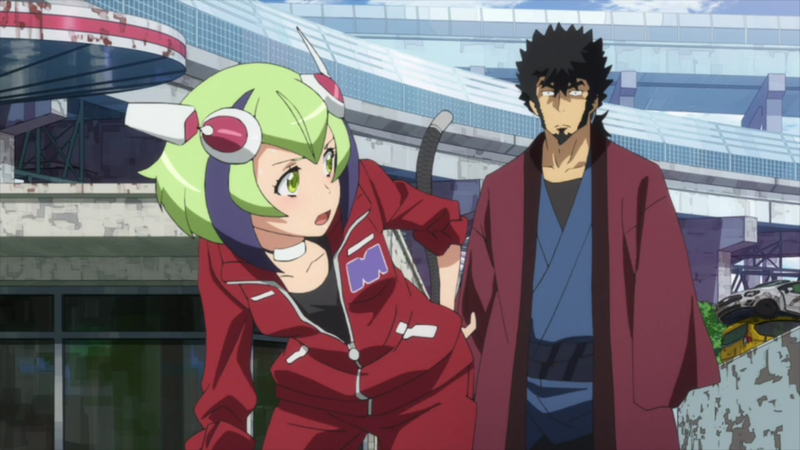 In fact, there are so many secrets, and Dimension W is such a malleable plot device, that you never really get true satisfaction from many of the plot developments. But the pseudo-science of Dimension W isn’t what the story is about really (despite how many long expository segments are devoted to it). It’s about loss and the acceptance of loss, and about the dangers of unchecked desire, all displayed through gorgeously animated action sequences and an eclectic cast of quirky characters. 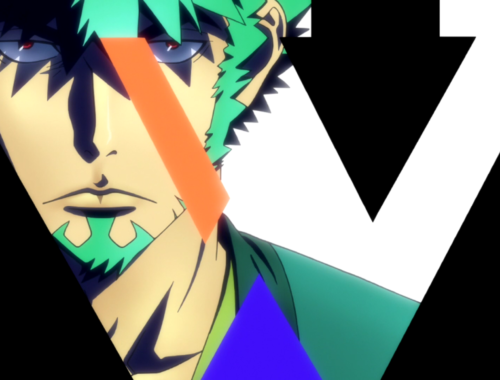 Whether it’s Loser, the prolific criminal who seemingly never succeeds at stealing but has become sort of a public hero and phenomenon for it, or the delightfully bizarre competing collectors featured during the story’s final arc, or just Kyouma’s clever use of his skewer-and-cable weapons, Dimension W is just a lot of fun to look at. And Mira is really, really cute. But still, I remember the creator’s Chikyu Misaki, a short but amazing work that deftly balanced the everyday with its over-the-top conspiracies, mysteries, and action, and I wish Dimension W was as evenly distributed. But I guess 12 episodes is not a lot of time to do both. I’d be curious if the original manga gives the pair more room to breathe and a more fleshed out, gradual path to the catharsis of their relationship—perhaps a bit more of that feeling that is repeatedly promised in the show’s closing credits. The entire collector premise is a great set up for a game of OVA. The collection missions serve as a clear episodic goal for each adventure, and coils serve as the perfect excuse for almost any Ability or special power. By the same token, very little in Dimension W really requires any special rules or elaboration of the concepts presented in the main rulebook. But taking a look at Kyouma, he’s a really fascinating build because his signature weapons really never do much, if any, damage. It’s a collection of tricks to bring opponents to his level where he can pummel them with abandon. What about you readers? 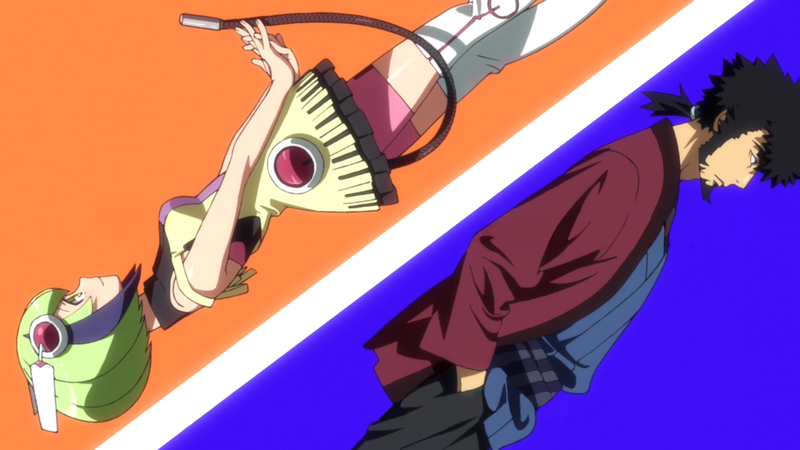 Do you have a favorite unlikely duo from anime? Or is there a particular android that sets your circuits abuzz? Tell me about it in the comments! 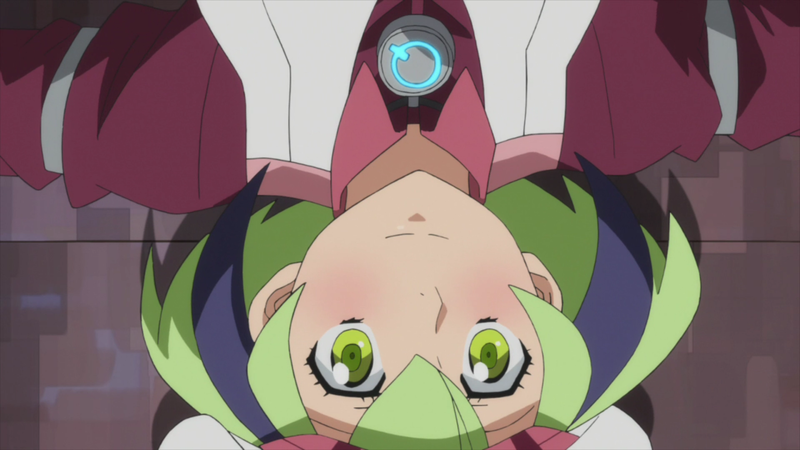 Also, if you’d like to support this blog, consider purchasing Dimension W merchandise like comics and figures or anything else from this link! If you’re an anime fan in the New Orleans area, you probably know all about MechaCon. Should the promise of panels, events, special guests, and legions of cosplayers descending on the Big Easy not ensure your attendance, you’ll have one more reason to go: Wise Turtle and MechaCon are teaming up! 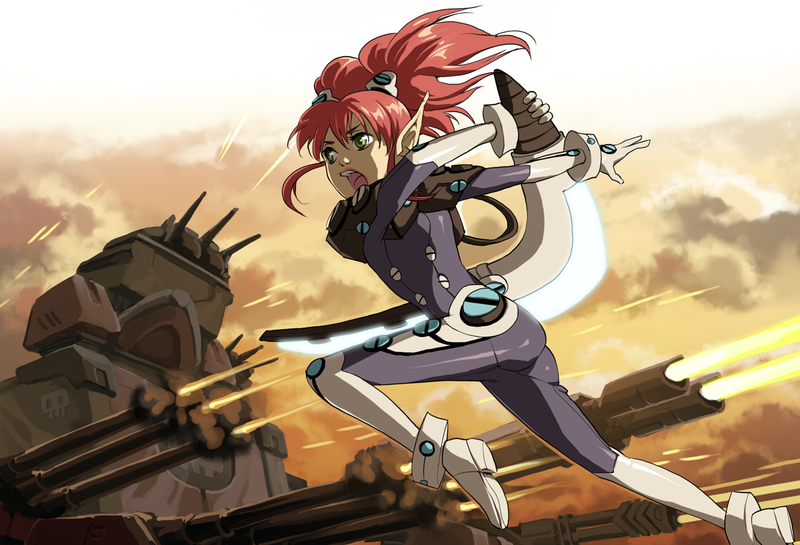 As the official RPG of MechaCon, OVA will power campaigns and content featuring their GEARE Universe. While much of this won’t kick off until next year’s convention, you can still drop by and pick up a copy of OVA and take in the sights and sounds of a bit of Japan in our part of the beautiful South. Ever since I watched .hack//SIGN over a decade ago, I have been in love with the idea of setting stories in the context of MMORPGs. I think it’s the coexistence of two worlds, of the real and the digital one, that immediately gives layers to every character, a bit of mystery and secrecy of the person behind the computer screen. Too, the way the “rules” of the online world are tangible and exact things, how they’re presented as a sort of setting-building that makes no apologies or excuses. Or maybe it’s just because it legitimizes a passion for video games in a tale of rousing adventure. But there’s never really been much like .hack since, leaving the entire concept a lonely and untapped genre. It’s especially conspicuous when you consider that MMO games are exponentially more relevant than they were in the early 2000s. So when I first heard about Sword Art Online, I was determined to watch it. The hook alone is pretty arresting, with thousands of so-called VRMMO players not just trapped within the game, but faced with the stark reality that dying in the virtual world also means death in the real one! Still, I had a few reservations. On the surface, SAO had the makings of yet another teenage male wish-fulfillment story, the kind where a normal geeky guy’s skill at video games makes him a hero and nets him the girl. I was prepared for that being pretty much all I got out of the show, but I was pleasantly surprised. That’s because SAO is dedicated making the game world more than just window dressing. 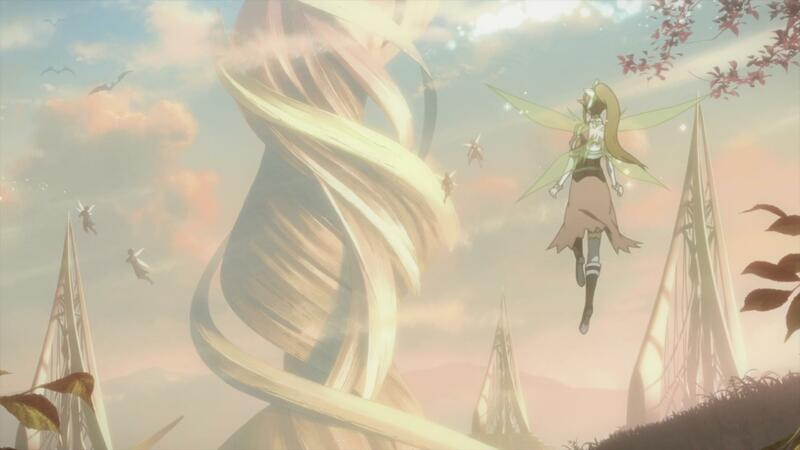 While its collection of rules and concepts are not always objectively sound if presented in a “real” MMORPG, Sword Art Online weaves its unique brand of video game logic through every layer of the narrative. Whether it’s the ebb and flow of its gorgeously animated, adrenaline-pumping battles and PvP duels, the fulfillment of quest lines and their requisite rare drops, or an entire episode devoted to a murder mystery wherein the culprit seemingly breaks the laws of SAO’s reality, the show never lets you forget that the world of Aincrad is part of a game. Even the protagonist, Kirito, has much of his golden-boy power and plot invulnerability explained by his previous experience as a beta tester. It’s great fun, and this exploration of the game itself is a piece of the puzzle .hack//SIGN glossed over in its version of the stuck in a video game tale. 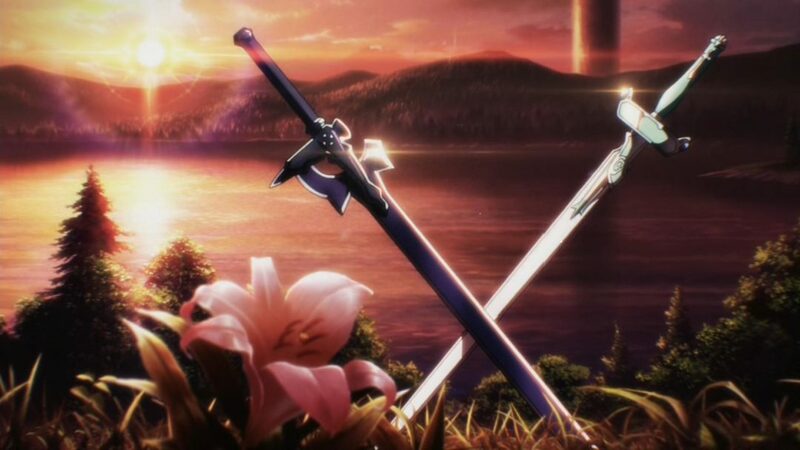 But for all its mechanics and RPG trappings, the first arc of SAO is as much about relationships as it is the crossing of swords. While it is a love story, describing it as just another teenage romance sells it short. It’s about forging friendships and family, coping with death and loss, and finding a way to exist in the violent digital world that has become reality for the thousands of players trapped in Aincrad. 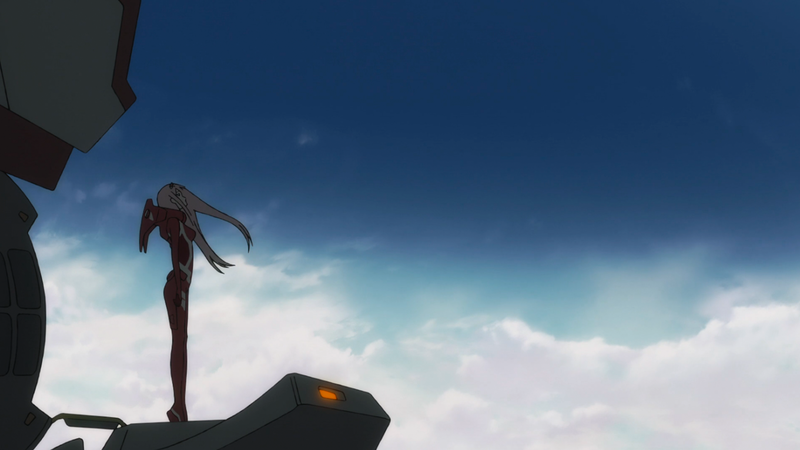 And Asuna, the show’s requisite waifu for Kirito, far exceeds such a label. 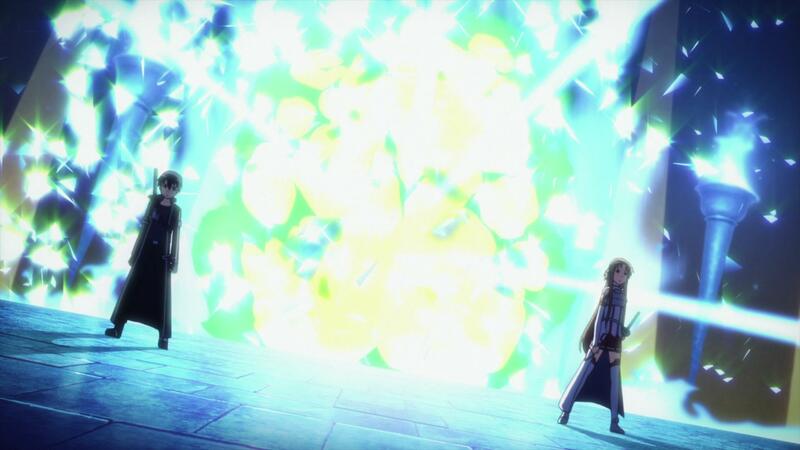 That’s because Asuna is more than a damsel backdrop for Kirito to show off his mettle. If anything, Asuna carries the show. While Kirito has his beta test experience and a few convenient plot abilities to fall back on, Asuna’s aptitude at the game was tempered in the game itself. 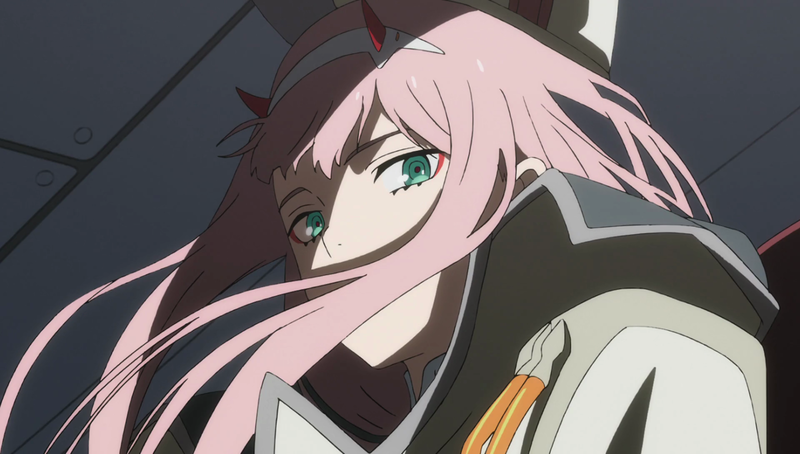 She is on the front-lines despite not knowing the road ahead, and it is through her own conviction and power that the day is saved at critical moments throughout the show’s first story arc. 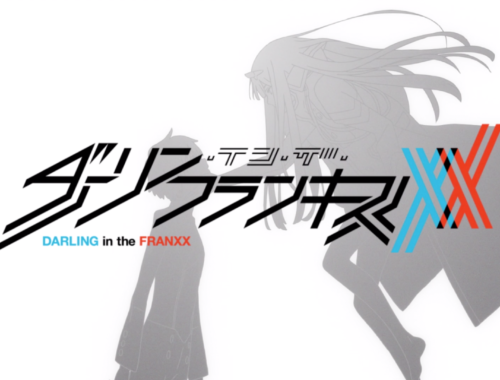 But it’s for all these reasons SAO’s second story arc “Fairy Dance” seems to fall short. The game that was so intrinsically tied to the narrative has become more of an afterthought, relegated to the weak PvP structure of Alfheim Online and a few beats dedicated to the new flying mechanics. 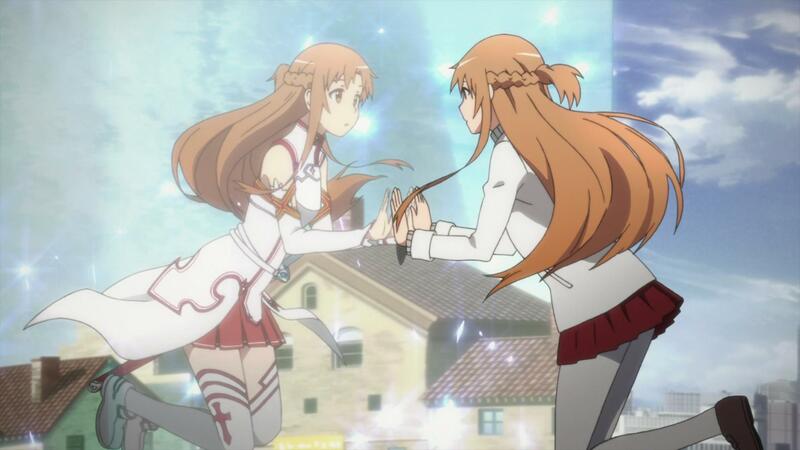 Asuna, for all her agency in the first arc, has become little more than a princess to rescue. And with Kirito logging into a new MMO where the “you die in the game, you die in real life” hook is gone, most of the dramatic tension evaporates. That’s not to say the second arc is bad. It’s perfectly watchable, and despite fan outrage that I largely chalk up to “She’s not Asuna,” Sugaha/Leafa is cute and likeable. It just doesn’t deliver on the promise exhibited in the earlier episodes, instead falling hook, line, and sinker into the mire of expectations it so expertly cast off before. 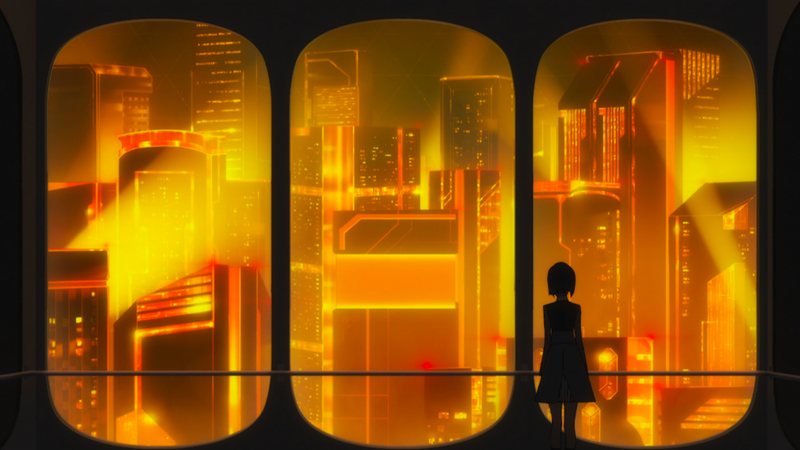 It’s easy to look at a show like SAO and want to apply a traditional level-based system to it and recreate the countless mechanical minutia that make up the VRMMO—but such granularity is rarely warranted. The mechanics are more of a narrative device than anything any character concretely follows. 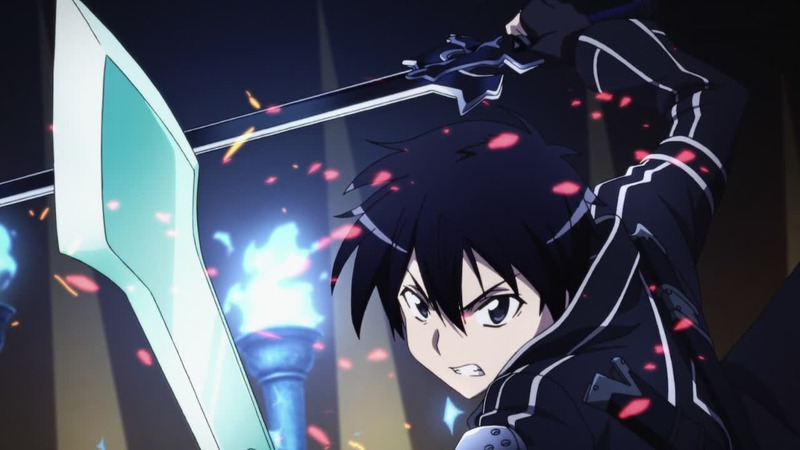 For example, Kirito’s passive regen ability is mentioned for exactly one sequence and never acknowledged again. Representing that Ability, if you really wanted to, can be treated as Armored, Barrier, or one of many other Abilities, since its only effect was to prevent receiving damage from his would-be PKers. Unsurprisingly, level too can be treated with much broader strokes. Instead of incrementing a multi-digit number one-by-one, characters instead receive a much more abstract Level Bonus, ranging from +0 (for the newbie rif-raff) to +5 (for the top tier, maxed out heroes of the story.) This Bonus applies to every action the character does. However in contested rolls, characters’ Level Bonuses will cancel each other out. Should a Level Bonus +3 character attempt to attack a Level Bonus +2 character, the effective bonus is only +1. And so on. 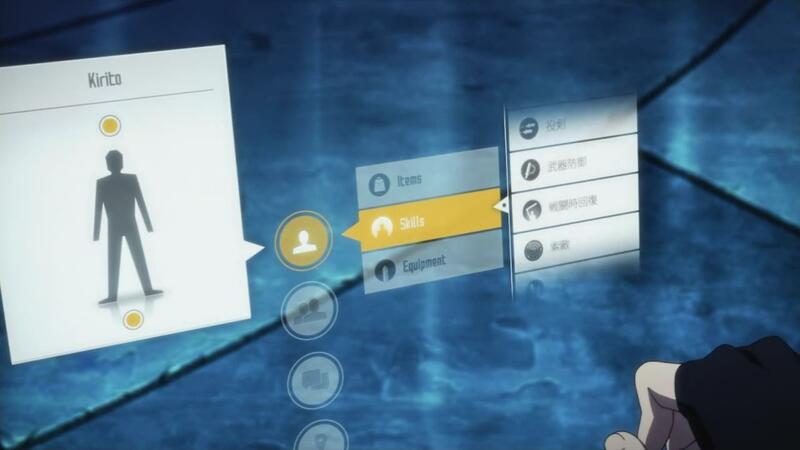 One of the more unique mechanics presented in Sword Art Online is the “Switch” technique that all characters have access to. Despite being the core strategy for winning a handful of seemingly unwinnable battles, it is never really fully explained (and seems to behave entirely differently in the video games based on the anime.) Yet, it inspired me to at least give my impression of how it would work in OVA. In addition to the usual complications in OVA, campaigns based on Sword Art Online feature another: the Flinch complication. As the name would suggest, the state is short and fleeting, not lasting until the opponent’s next turn but existing only in the brief moment in time it is inflicted. The exact effect differs depending on the opponent. Some enemies with seeming impenetrable armor will briefly reveal weaknesses, losing their Armored bonus. Others will let down their guard, eliminating their Defense Roll. Whatever the circumstances, there is revealed a brief window of opportunity. This Flinch complication is inflicted in one of two ways: One is by dealing any other combat complication, which will also inflict the Flinched status. The other is reserved for enemies with large, heavy-hitting weapons or attacks. If they should ever attack a character but deal no damage, they are immediately put into the Flinched state. To take advantage of the Flinched complication, characters mustSwitch with an ally. By giving up their next action, the ally character may act immediately, garnering what benefits are to be had from their briefly Flinching opponent. 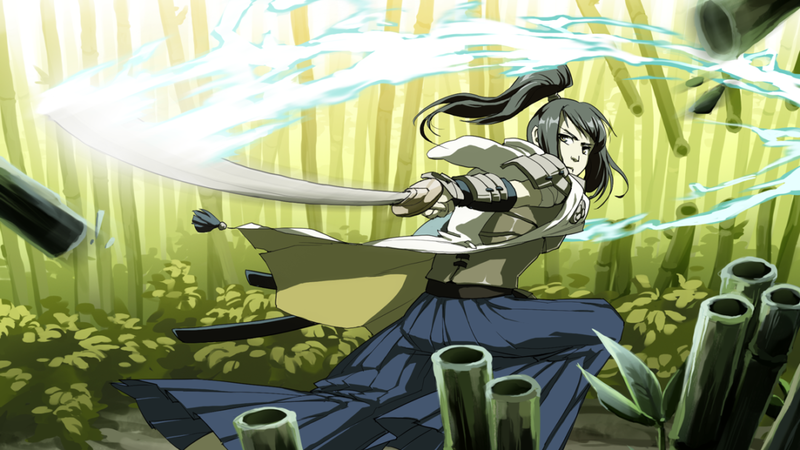 Once two characters switch, neither character may do so again until their next active turn. But in this way, even the toughest enemies may fall! So, readers, if you were to find yourself unable to log out of an online game, which one would you want it to be? 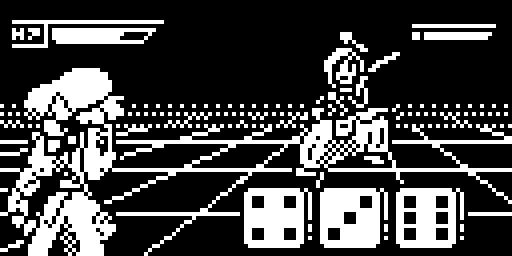 Or for a more realistic question, what online video game do you really wish there were a tabletop RPG version of? 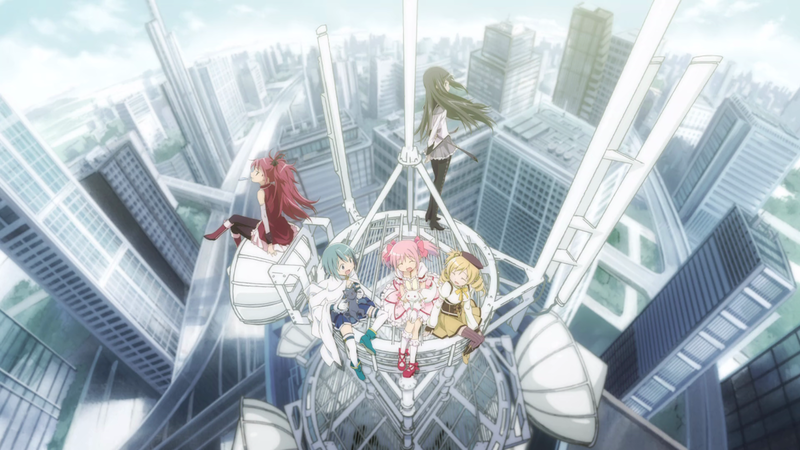 More than many series, Puella Magi Madoka Magica thrives on its world-shattering reveals, twists, and surprises, all of which come heavy and often. If you haven’t watched, but you’re thinking about it and somehow have avoided spoilers of its numerous plot doozies, here’s what you need to know: Madoka is an attempt to capture the darker realities of what being a magical girl entails—the risks, pressures, and responsibilities of having that power at such an inexperienced, impressionable age. That, and it is a show with so many helpings of moé—that amorphous Japanese ideal of cute—that anyone without at least a marginal taste for it will likely choke to death. 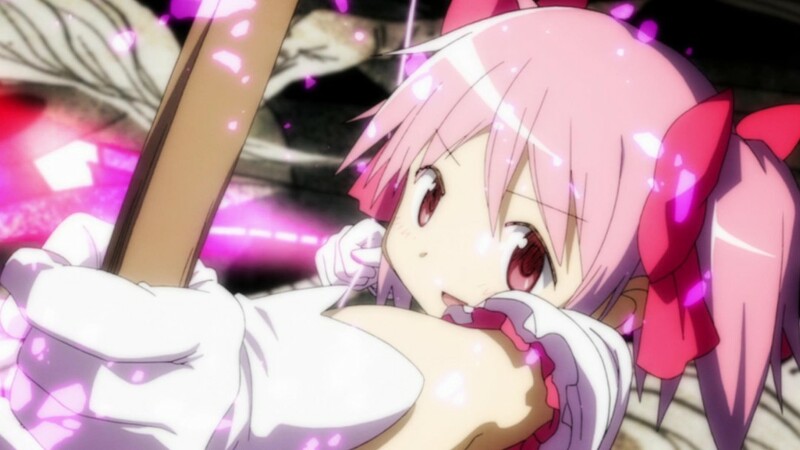 Though it’s not a journey without faults, among them a terribly slow start and some thin characterization here and there, Madoka succeeds where it counts, providing a deeply touching, often grim story many have wanted from the genre for a long time. And even if its deconstruction of magical girl tropes doesn’t tug at your heart strings as much as it did mine, the ethereal visuals backed by Yuki Kajiura’s extraordinary, choral-infused soundtrack are worth experiencing by themselves. While I am loath to do any major spoiling in my overview here, I think it is a testament to the show that for all its turnarounds and revelations, it holds up to repeat viewings and—dare I say—is possibly better for it. Motivations that seemed arcane before are clear, and countless details unnoticeable the first time around are scattered throughout the narrative. And for all its slow pacing for the early part of the show, Madoka sets up what will be its biggest strength: The show really isn’t about Madoka at all. When you discover the heart of the matter, every frame becomes a cherished part of the whole. Put short, watch it. Even if its themes don’t resonate with you, I would be hard-pressed to believe that something, somewhere doesn’t grab you and refuse to let go. 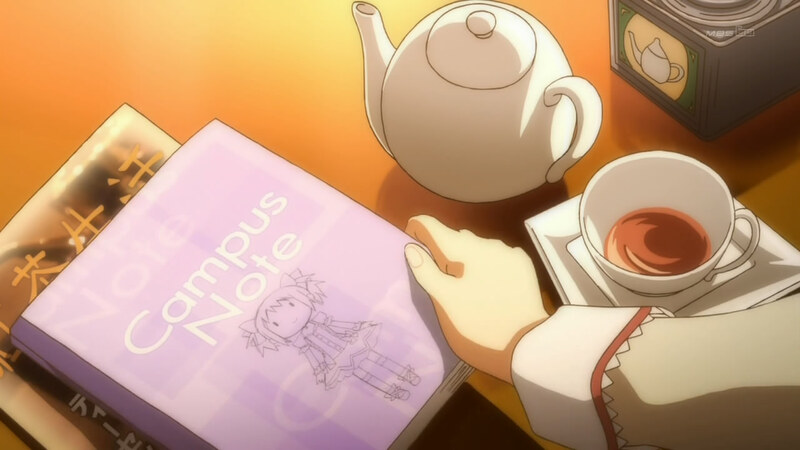 To discuss representing the concepts of Madoka Magica in OVA without giving much of its plot away is impossible, so read onward at your own risk. Here there be spoiling dragons. To become a magical girl, a young girl must make a contract with Kyubey. In exchange for committing their lives in the service of fighting witches, they are granted a single wish. The nature of this wish has a direct effect on the powers of a magical girl. 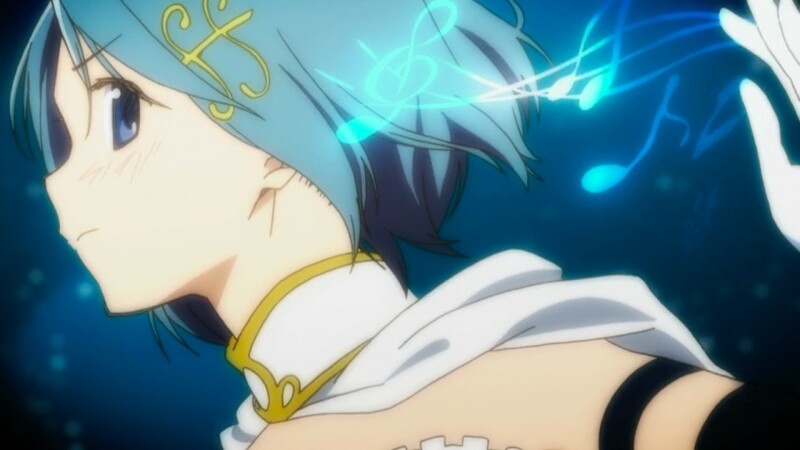 As we see in the show, wishing for the healing of her friend grants Sayaka the power of quick-healing. Homura wanting to go back in time has given her mastery over time itself, and so on. You should consider the wish and its potential carefully when making your character. 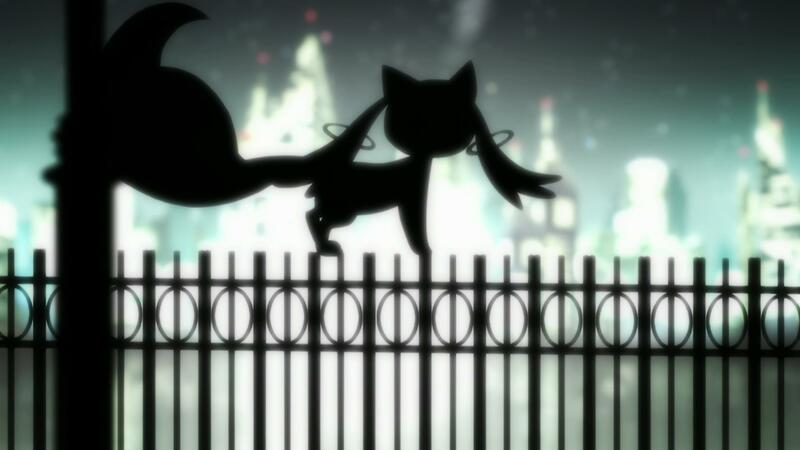 Magical Girls also possess telepathy, allowing them to communicate freely with each other, Kyubey, and even normal humans without actually speaking. This is not the same as Psychic, since they cannot actually read thoughts that aren’t deliberated exchanged, nor is there any possibility to influence the thoughts of others. 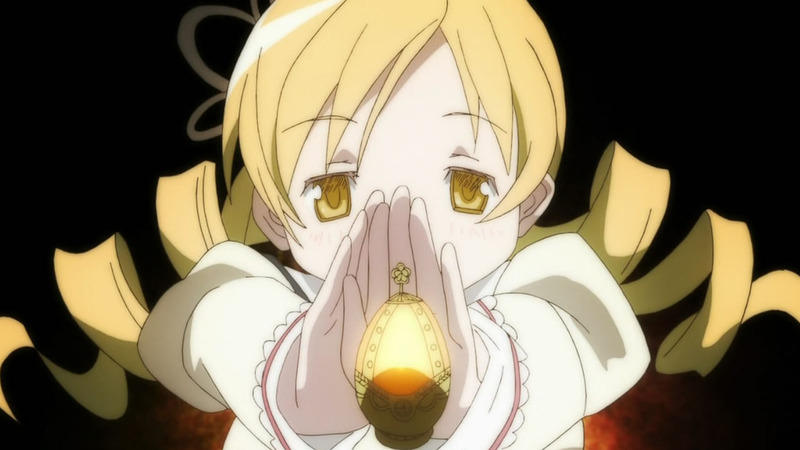 After becoming a magical girl, a character’s soul is removed from her body and encapsulated in a glowing egg called the soul gem. This is to protect the soul against the rigors of battle and to divide the character’s consciousness from the body in order to withstand the great pain fighting witches and their ilk can bring—something a conventionally mortal soul could not endure. 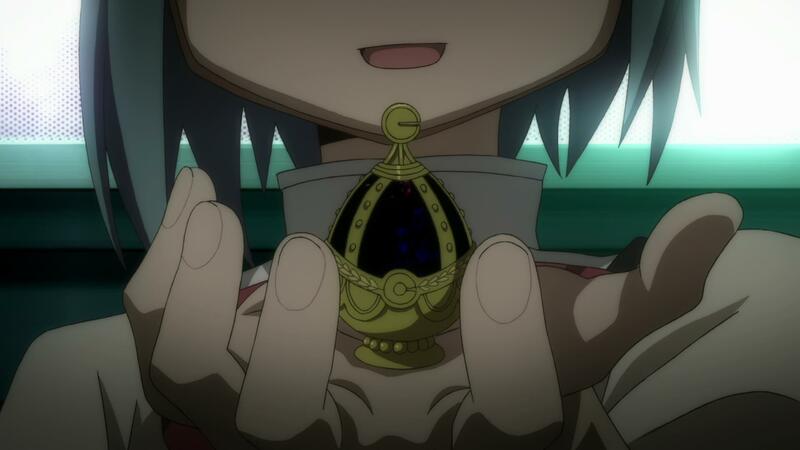 Because of its small size and magical properties, the soul gem is relatively safe from harm, and while it remains intact, the magical girl cannot die. However, Soul Gems can be broken. Should a character receive an attack of Damage equal to their maximum Health total, the gem is shattered and the character dies. 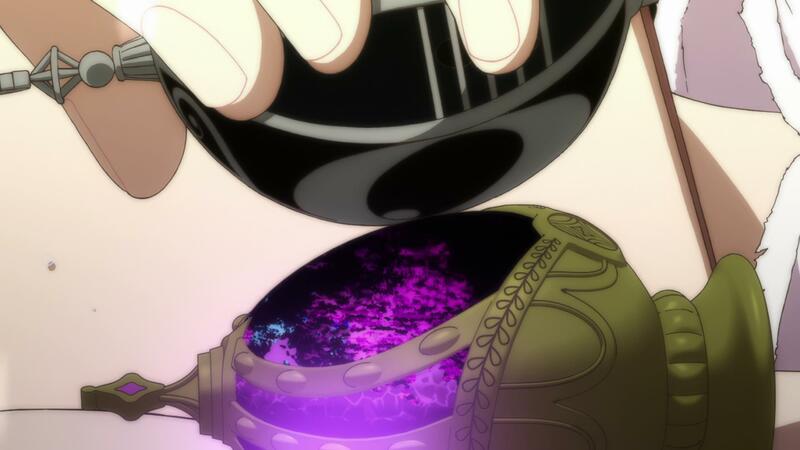 It is also possible to target a magical girl’s soul gem directly, but few are aware of its secret (including witches) to take advantage of this. In addition to Health and Endurance, every Magical Girl has a special third total called Despair. However, instead of starting at a number and being reduced, Despair begins at zero and counts up. 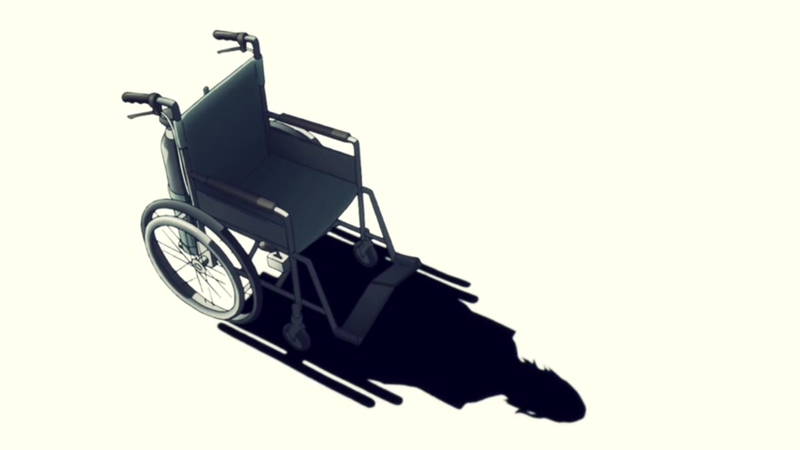 As the title suggests, Despair represents a magical girl’s inevitable decline to becoming a witch, but it is also the source of one of a magical girl’s greatest strengths: the ability to go beyond the limitations of Health and Endurance. At any time, characters may choose to add to Despair instead of reducing Health or Endurance. This effectively makes it possible to avoid the penalty from zeroing out one total or the other, and it also allows a magical girl to keep on fighting well beyond what would be possible otherwise. It is even possible for a magical girl to persevere without remaining Health and Endurance at all, as long as they are willing to increase their Despair. If both Health and Endurance are reduced to zero, apply a –2 penalty to all actions. As Despair increases, the taint of a magical girl’s soul gem becomes more pronounced until it becomes entirely black, at which point it shatters and becomes a grief seed—the core of any witch. Once Despair has reached 40, magical girls must make a roll against succumbing to the overwhelming grief every time they choose to add to the Despair total. The difficulty number is equal to the tens digit of Despair. So a magical girl who has reached a Despair of 65 would roll against a difficulty of 6. 120 would be a DN of 12. And so on. Players may add Iron-Willed and other appropriate Abilities when making this roll. Likewise, Weak-Willed will prove a detriment. Once this roll is failed, the magical girl is doomed to become a witch. While exchanging dialog with other player characters or performing a few more minor actions is possible, when the plot permits, the character is lost to the world and turns to darkness. Despair and Grief In addition to willingly increasing it, a character’s Despair may increase due to circumstances. Despair and Time Even if a character should avoid making use of despair, the simple state of being a magical girl will taint the soul gem with time. At the beginning of every adventure after the first (presumably the one where the character made their contract) add 5 to the Despair total. Reducing Despair There is only one way to shed Despair and return light to one’s soul gem, and that is by defeating witches and making use of their Grief Seed. The efficacy of this seed depends on the strength of the Witch—which in turn depends on the amount of Despair that the Witch had before it was transformed from magical girl. Using a grief seed removes an amount of Despair equal to half the total of the fallen magical girl it derives from. Of course, these rules derive from the world as presented in the majority of the TV series. If you wish to set a game in the aftermath of the final episode, or even during the movie Rebellion, you will need to make some adjustments. It’ll come as no surprise that I love anime. I wrote the (RPG) book on it, after all, and my twitter feed full of anime-style artwork is verification enough. But at the same time, so much anime I watch feels like it has qualifiers, excuses that need to be made to fully and heart-feltly recommend. “This show is great if you don’t mind the fanservice,” or “You have to check your brain at the door, but it’s an amazing ride.” That’s not to diss these things, as sometimes you just want brainless fanservice action romps, and there’s nothing wrong with that. But every once in a while, an anime like Erased comes along, and it really reminds me what a great show can be. A show that is good without any buts. A show that’s just good, really. In Erased, Satoru is an aspiring manga artist and part-time pizza delivery man, seeming to rather listlessly make his way through life. But soon we discover that Satoru is far more than ordinary, as he possesses the strange ability he dubs “Revival.” When something horrible is about to occur, his body involuntarily jumps to moments before in time, giving him a second chance to notice what is awry and do his best to set it right. It’s an intriguing premise on its own, but when the death of someone close to Satoru results in him being framed for the crime, Revival kicks into overdrive and send him all the way back to 1988—to his childhood days where he and his classmates experience the abduction and death of fellow students. As an adult-minded Satoru relives his youth, he realizes that these murders may be the source of his misfortune in the present, perhaps the origin of everything, and he sets out to change the future. If this power, this mystery, were the only things Erased had going for it, it would still be a great show. But every frame is brimming with tiny details. Cameras lovingly pan over home-cooked meals, shoes slipping off to reveal hole-y toed socks, and moths fluttering about electric lights. It’s easy to refer to these things, these vignettes into the everyday, as pleasing but unnecessary, but such words couldn’t be a bigger disservice. It’s these minutia that really bring home Satoru’s reliving of his past. As an adult, these things that are so fleeting and inconsequential to a child are so much more to his adult self, and Erased does well to give them this nostalgic gravitas. This especially true since Satoru’s success in changing the future has as much to do with changing his relationships in the past as it does his detective work. His efforts to keep Kayo, the serial killer’s first victim, from being vulnerable and alone develop into much more, as they each discover the truth in each other and the insecurities he didn’t fully understand as a child. It’s not just Kayo, either, as Satoru reaches out and makes deeper, more profound connections with his core circle of friends, eventually enlisting them on his quest to thwart the dismal future. The show deftly juggles the murder mystery and everyday life, Satoru’s past and present, and spans of calm and drama in a way that neither ever outlives its welcome. It’s a mixture that thrives on each other, and the show’s pacing perfectly sets up the conclusion in a way that imminently satisfying. That’s not to say the show is without faults. One of the main antagonist’s characterization is embarrassingly thin; even the serial killer that serves as the catalyst for the entire story isn’t much better. But that’s okay, because the story isn’t really about them. It isn’t really even about the murder mystery. It’s about people treating each other with kindness, learning to see past the failings of ourselves and others, past the barriers we erect around us. And connect. Because we don’t have to be alone. 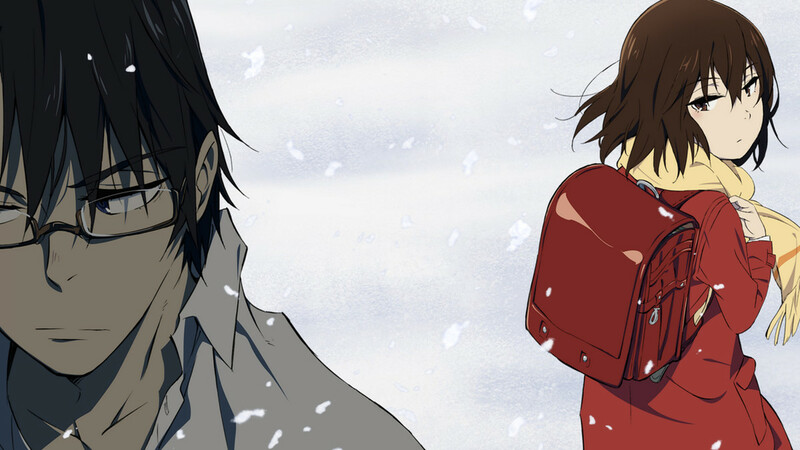 Erased isn’t the sort of over-the-top high-octane show that lends itself to a bunch of new rules. 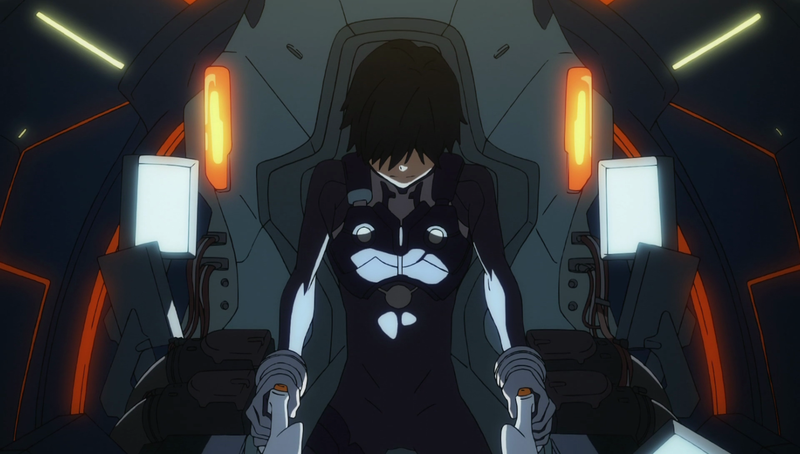 The show is a framework to display, trite though it might sound, the power of friendship, and the best way to do that is load up your characters with Weaknesses that lend themselves to isolation and Abilities that they can use to help pull each other out of their self-imposed cages (or the cages imposed by others). 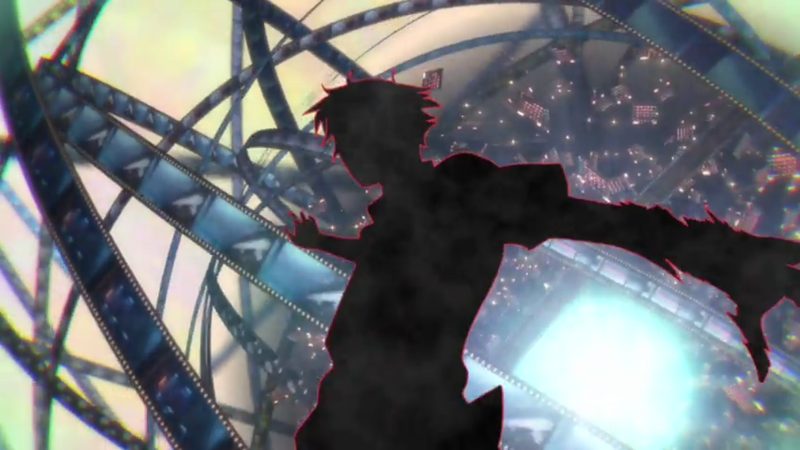 Of course, there is one facet of Erased that begs to have a few rules applied to it, and that is Satoru’s “Revival.” Though later on it’s used almost solely as a plot device to send Satoru to his past, as presented in the early episodes, it’s the sort of Ability that could really find use in all kinds of adventurous campaigns. Revival—Time does not flow smoothly for you. When great misfortune, harm, or other danger happens around you, your life’s clock rewinds a few precious seconds, giving you a second chance to notice what has gone wrong. This awareness is not automatic, as you only know that you have jumped back into the past, not the exact reason for it. The greater your level in Revival, the more time your character rewinds backward, giving you longer to assess the situation and act upon it. Add your Revival Dice to any actions you manage to take during the span of time that you repeat. If you can’t discover the reason for the Revival (with Abilities like Perceptive or Sixth Sense) or act on them in time, the Revival and its Bonus dice end. 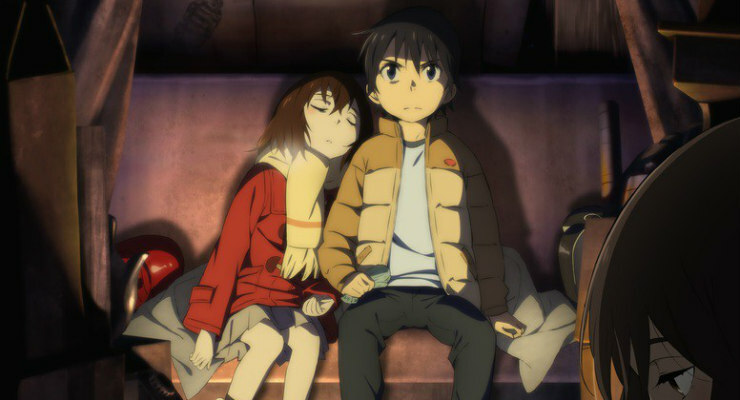 So that’s it for Erased! I plan to keep doing this for anime I watch, so let me know if you have a favorite you’d like to appear on the blog in the comments! Those of you who happen to have a copy of OVA’s first edition might remember its afterword, wherein I described my early adventures in RPG design and an epiphany concerning how to make OVA not only better, but different from any RPG that had come before: by dropping hard-coded stats from the game. But it wasn’t the first RPG to do that. Not quite anyway. I’d later discover that characters being made up of customizable traits instead of a preset array of attributes had been done by Ross’s RISUS and before that by Tweet’s Over the Edge. They’re not quite the same of course—OVA goes so far as to define a vast collection of its Abilities and Weaknesses (making up the longest chapter in the book), while both of the aforementioned titles are far more freeform affairs. But even so, it was a big step for quote-unquote anime RPGs, and considering how grounded I was in the RPGs of the 80s and 90s, it was still a big step for me. When I approached the new revised edition of my game I wanted to do my best to keep my eyes open for similar evolutions in its design. 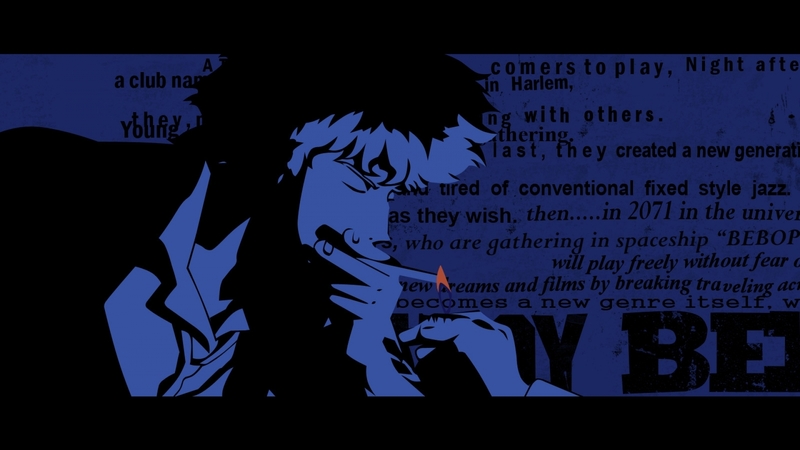 Something that was important to me in the original OVA was not to punish players for being “cool.” My favorite example of this is the protagonist of Cowboy Bebop, Spike Spiegel. Again and again throughout the series, Spike is shown to be a skilled martial artist and marksman. This is a build that simply doesn’t work in many RPGs because it requires putting points into two usually separate skills, hand-to-hand and guns. What little versatility is offered by training in both is quickly overshadowed by the limited resource of build points—a character can only be half as good in two areas as they could be in one. But Spike isn’t just sort of good at both, he’s great. And if you couldn’t create Spike with ease in OVA, then that’s as much of a litmus test as anything. With that in mind, I condensed every combat skill into an Ability called, well, Combat Skill. With one attribute, your character was adept at attacking, whatever form that takes. Sure, it flies in the face of most RPG design that routinely compartmentalize such things, but it just made things so much easier. You could still just do one thing, of course, but if you ever wanted to branch out, you weren’t punished for it. But the original OVA still didn’t eliminate the issue. While your ability to hit your opponent was sufficiently simplified, there were still several Abilities to cover actually doing damage. Martial Arts increased damage barehanded, Weapon gave you a weapon, and Power Move let you create a suite of special attacks that dealt even more damage but burned Endurance. It’s a system that worked, but you were still faced with paying more points to build Spike. You had to buy Martial Arts and Weapon—and arguably Power Move to boot. So I made the single most drastic change between the editions of OVA, I condensed all the damage-increasing Abilities into one called Attack, just as I had with Combat Skill years before. While this did solve the Spike Spiegel issue deftly, probably the biggest boon from this was that it rolled the idea behind Power Move into an Ability that allowed every character to create a suite of attack moves. Whereas before it was limited to flashy energy blasts and the like, now every strike could be its own separate technique. Samurais could swap between offensive styles, ninjas could throw in a sweep kick in their repertoire, and, yes, Spike could mix up gunplay and really swanky fisticuffs. It’s a system that just works for recreating the cinematic style of combat. Moreover, because all Attack represented was your capacity to dish out damage, characters could literally describe these attacks as anything they want at any time. Want to smash a chair over an opponent’s head or stomp a loose plank into their groin? Use your Attack level without worrying about calculating the actual damage of these impromptu weapons. Characters do this all the time in action anime, but it’s typically very hard to recreate in an RPG. No longer! While this was easily the most gratifying change to OVA, there’s a vast variety of additions and improvements that I’m also fond of. The original game’s “knockback” was split into three separate combat complications, giving more tactical options to the otherwise streamlined rules. Looking at these, I realized that I could take the same concept and apply them outside of combat, and Succeeding with Complications was born. 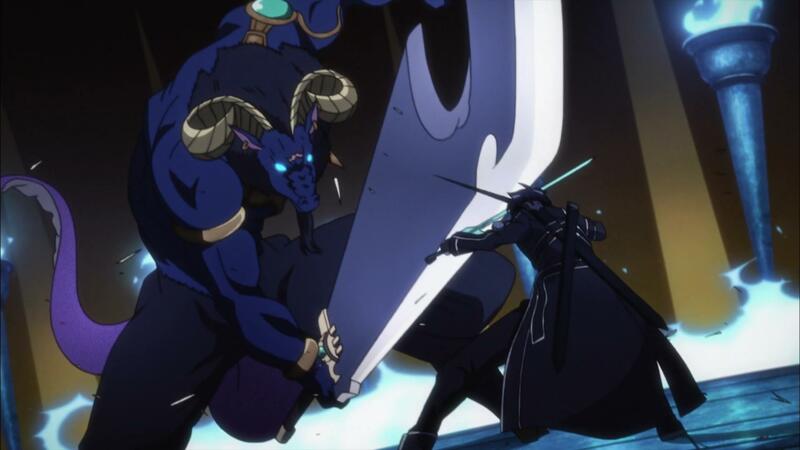 While I won’t be foolhardy enough to claim this is an entirely new idea (Fate, if nothing else, pushes the “fail forward” concept hard), I’m really please with how neatly it fits into OVA and brings combat and out-of-combat closer together thematically. Scale was another useful addition, making it really simple to represent vast differences in ability. 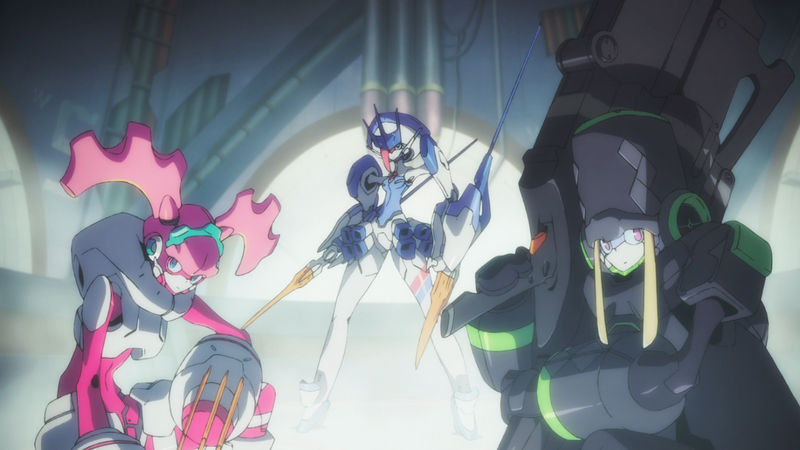 Need to have a mecha and a battleship go toe-to-toe? You can do that. How about a plucky Pokémon trainer and a tank? Sure, why not. The bout between mere martial artist and a Super-Saiyan martial artist? Faster than you can say, “ His power level is over NINE-THOUSAAAAND!” It’s all represented by a +5 bonus, and it just makes what can be really difficult in other RPGs quick and fun. And that’s it for three-part my retrospective of OVA! How about you, readers? Do you have a particular favorite addition to the revised game? Or perhaps you remember a houserule for another RPG that you thought was really novel? Let me know in the comments!